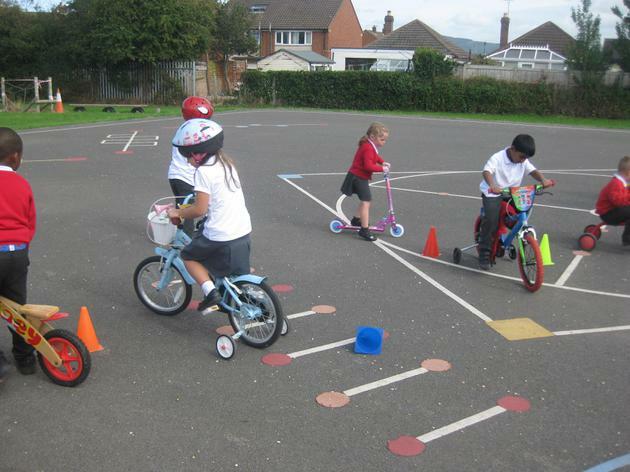 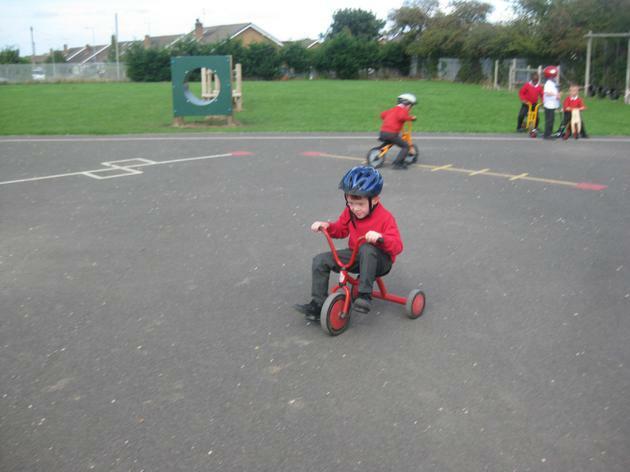 We continued our work based on Mrs Armitage on Wheels this week by looking at how she could have more energy so she wouldn't need to add any more items to her bike to make it go faster! 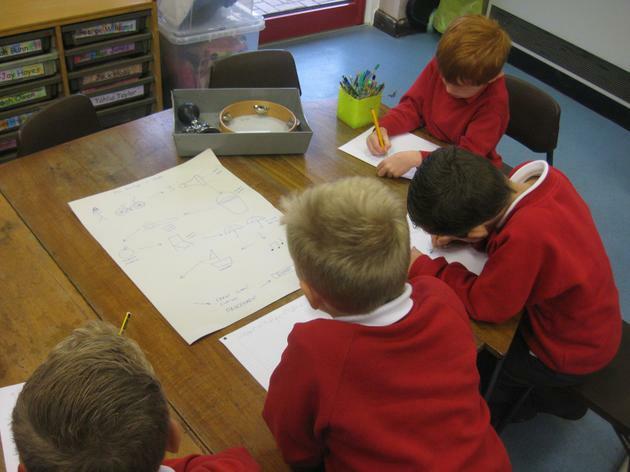 We started by mind mapping our ideas and discussed healthy diet, exercise and rest. 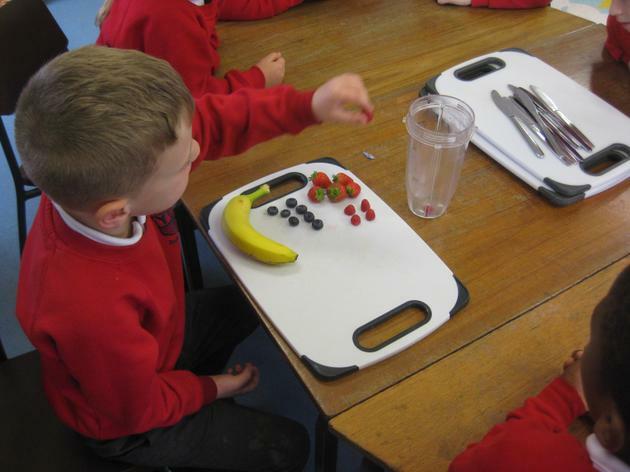 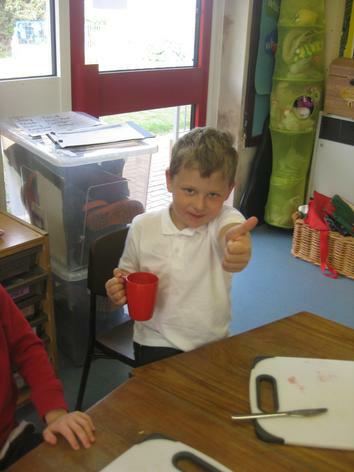 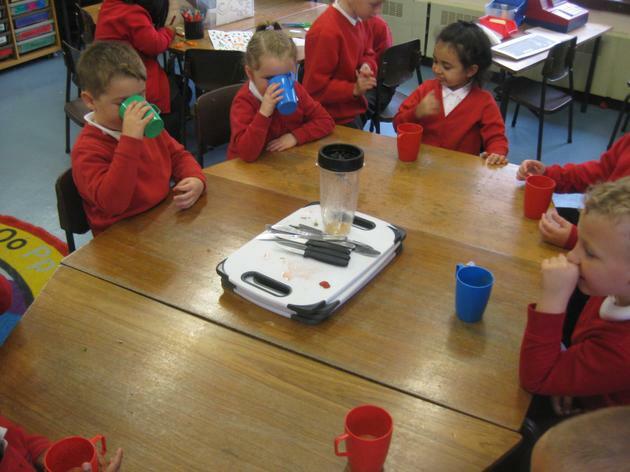 We then went on to create our own fruit smoothies as a healthy snack for Mrs Armitage. 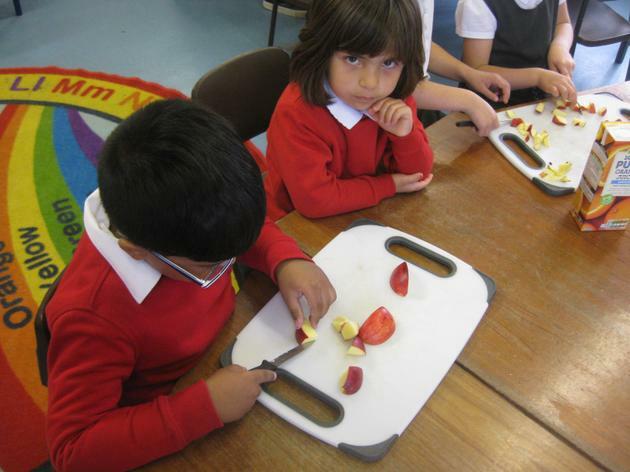 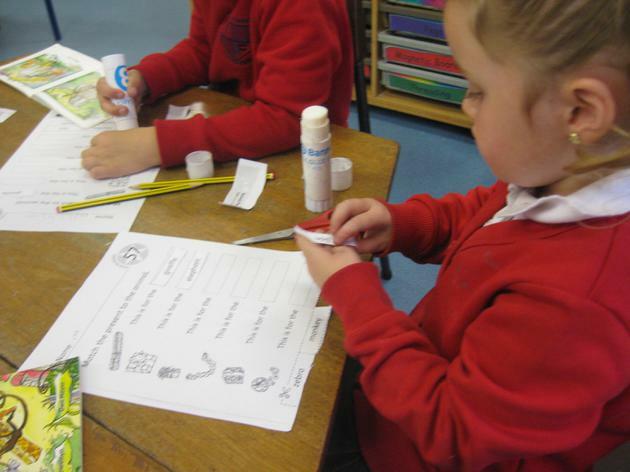 We looked at the different ingredients and decided as groups what we would like to use. 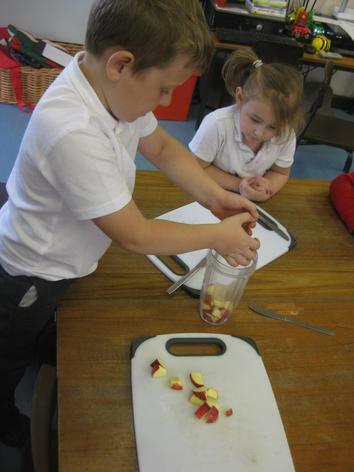 We chopped the fruit ourselves and Mrs Cooper put it all in the blender. 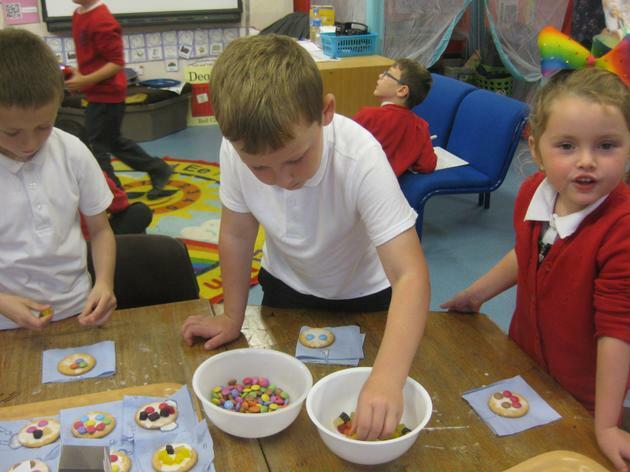 Afterwards we tasted them and they were delicious! 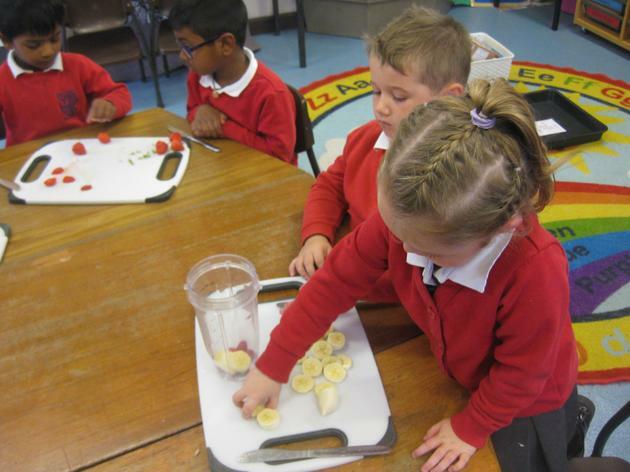 Once we had all tried making our own smoothies, we wrote recipes that we could send to Mrs Armitage to give her some ideas! 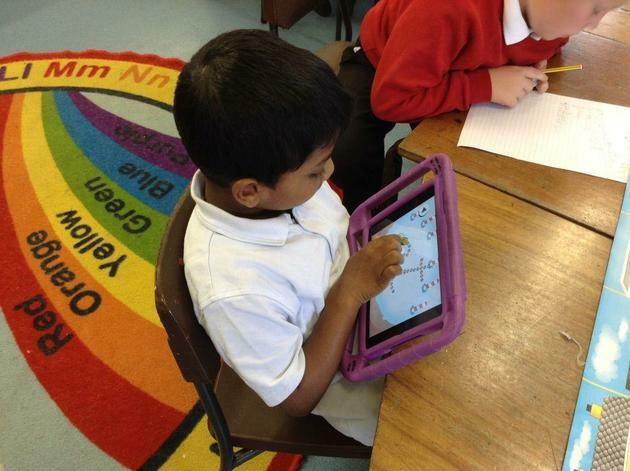 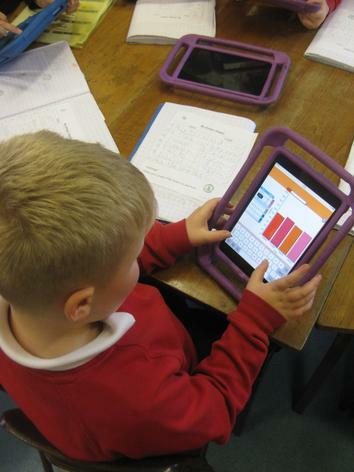 In maths our main focus for the week was data handling. 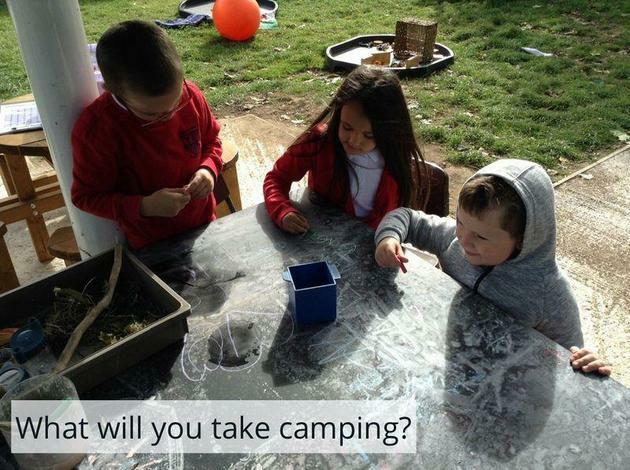 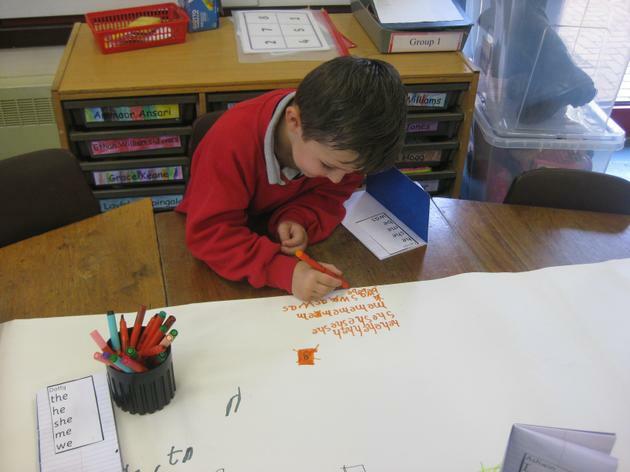 We started by creating a survey asking 'How do you travel to school?' 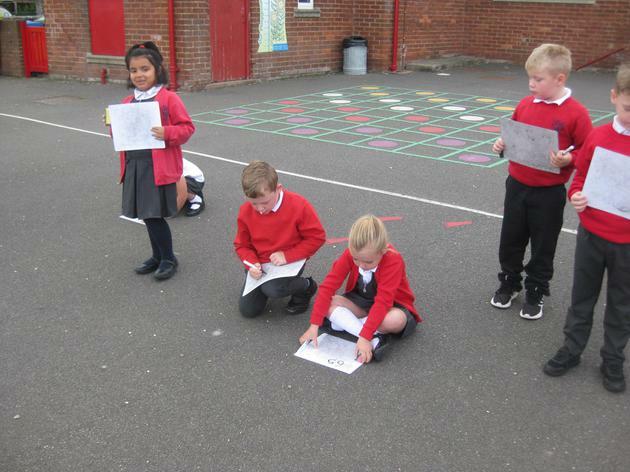 We recorded to results in a pictogram. 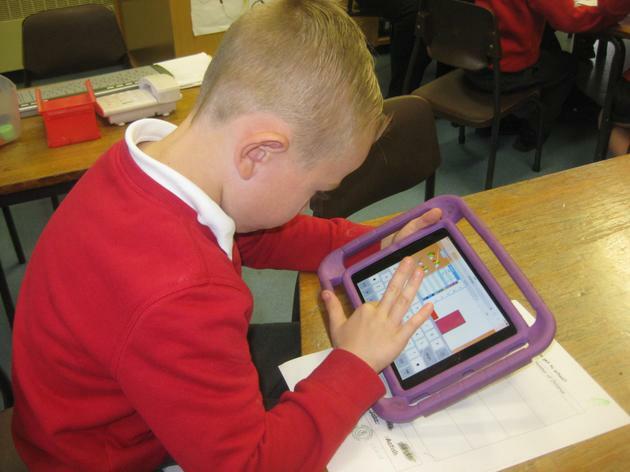 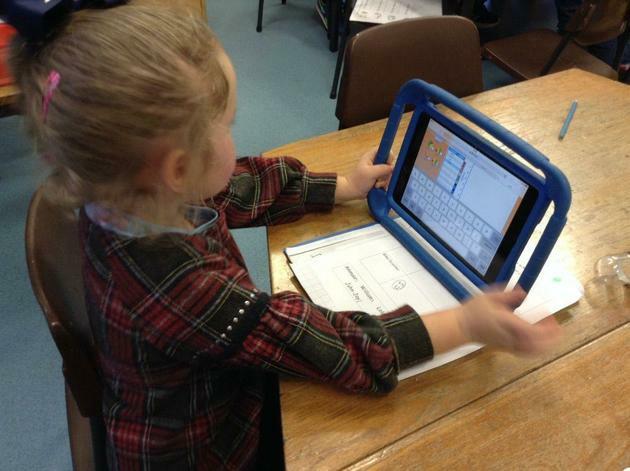 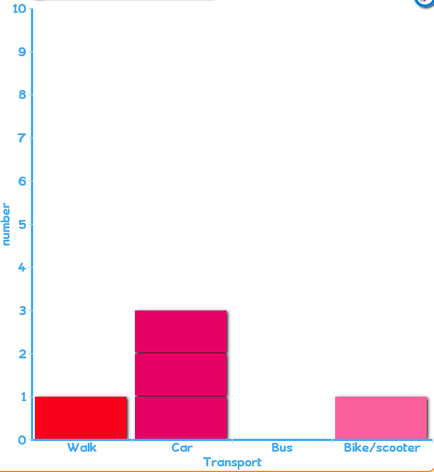 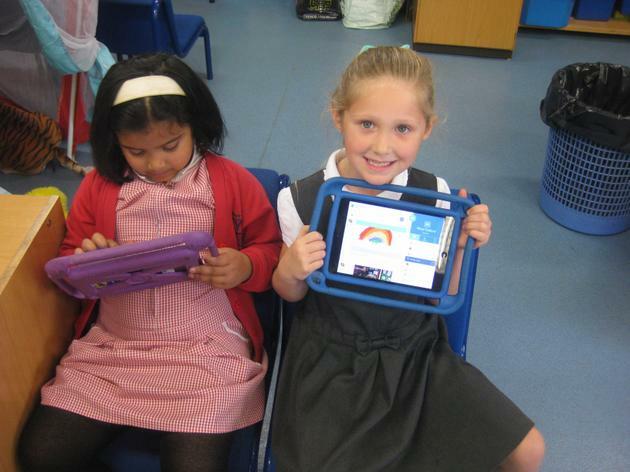 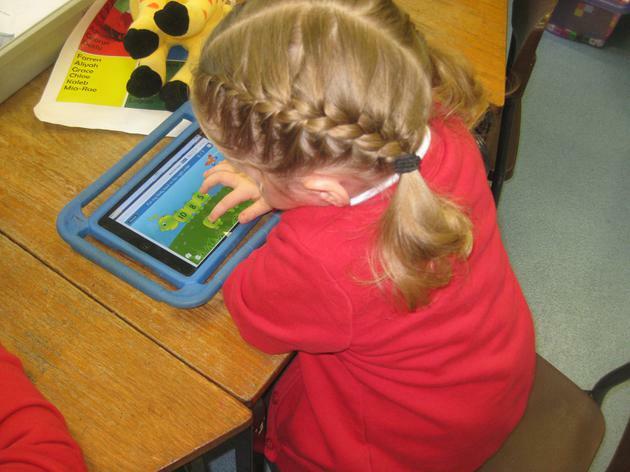 Later in the week some of the children used Hwb to create bar graphs showing their survey results. 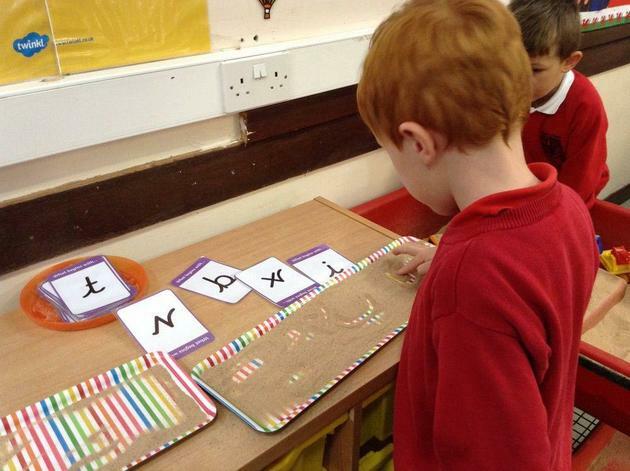 In Welsh we used our 'Siop Snac' to practise using 'Ga i...?' 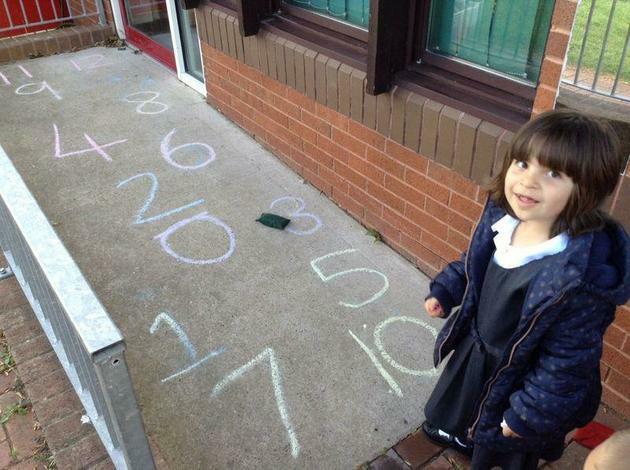 to ask for what we wanted. 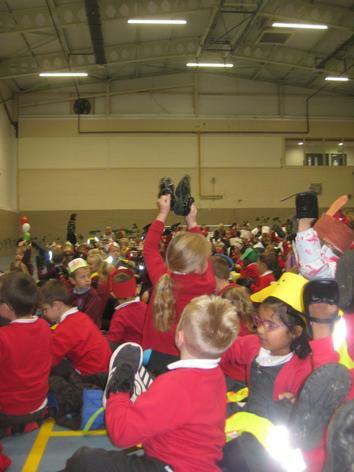 On Thursday morning we performed the story of Mrs Armitage on Wheels to the whole school in assembly. 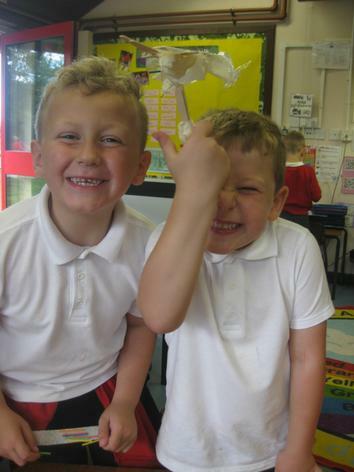 The children were fantastic! 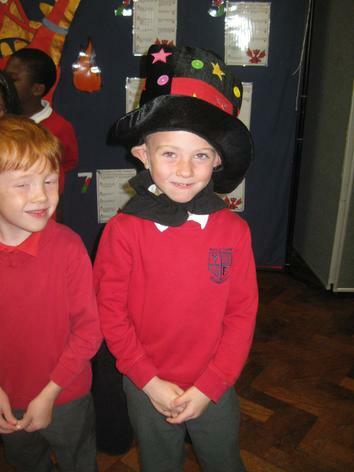 If you would like to see the performance, their is a video on our class page. 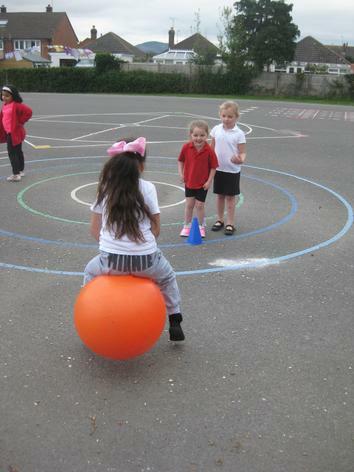 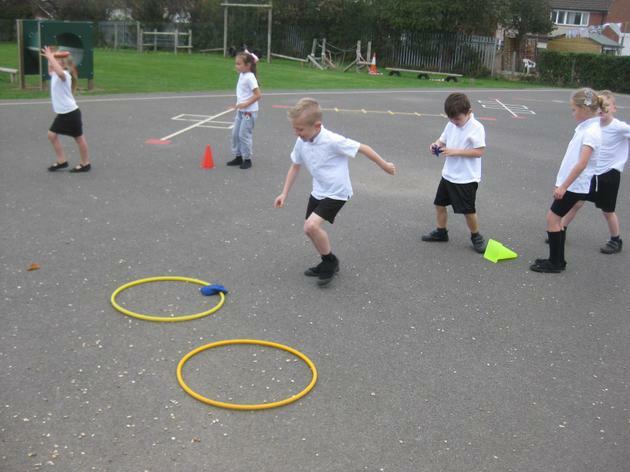 In PE we completed circuits, which Mrs Armitage could use to keep herself fit and healthy! 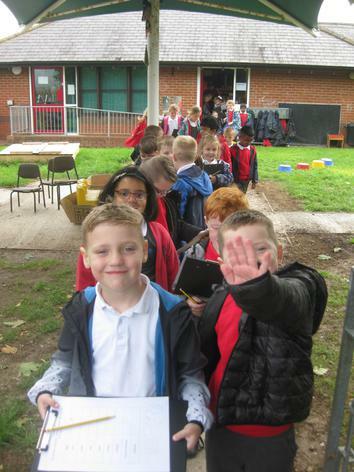 We started the week with a trip to the Jambori. 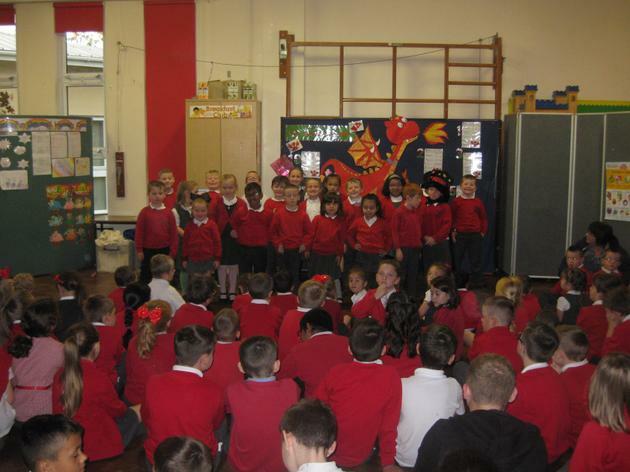 We all had a great time and really enjoyed singing the Welsh songs. 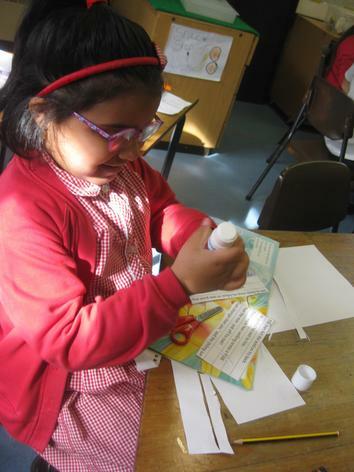 This week we have continued with the focus of recycling. 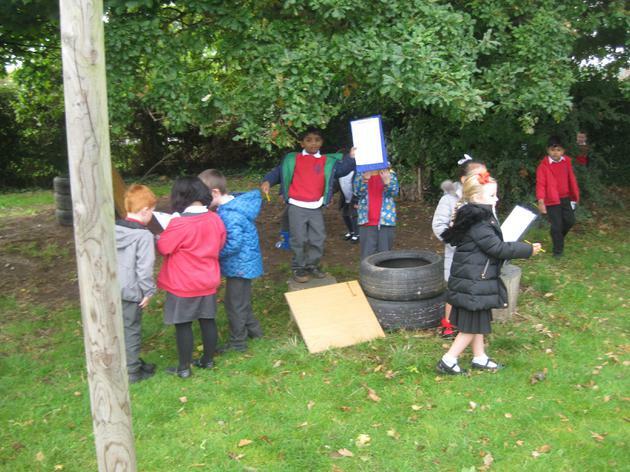 We worked in groups to create songs about why recycling is important and how we can help. 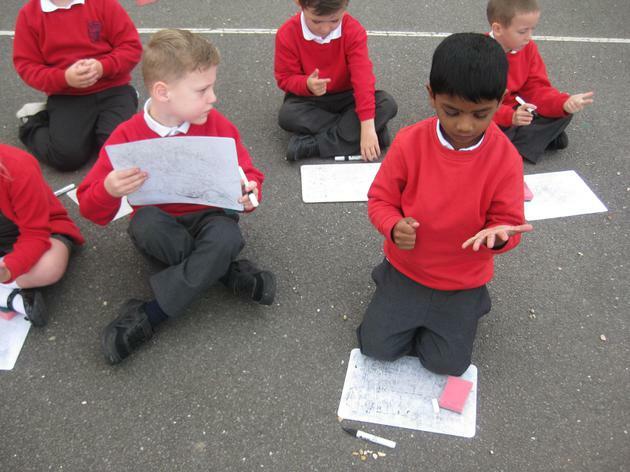 We had to work together to write lyrics and choose sounds to make the music. 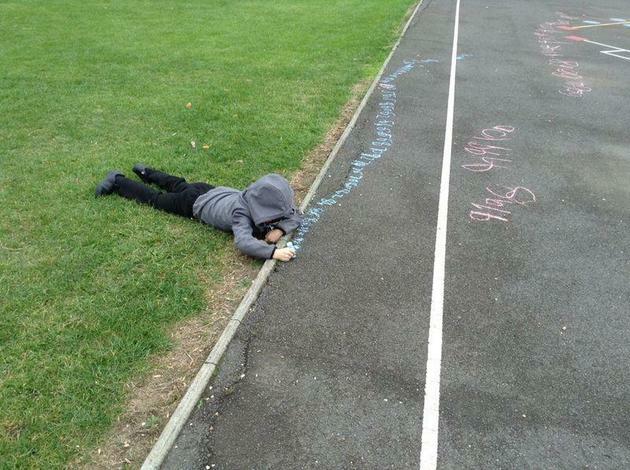 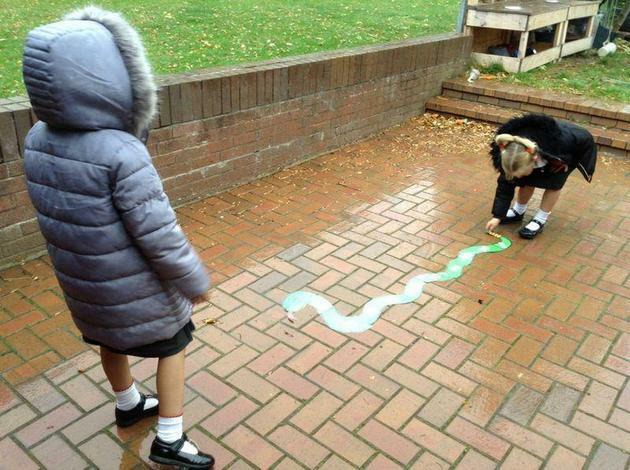 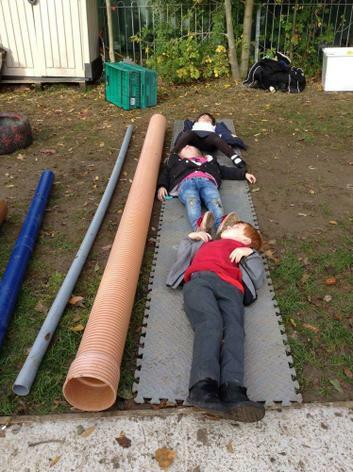 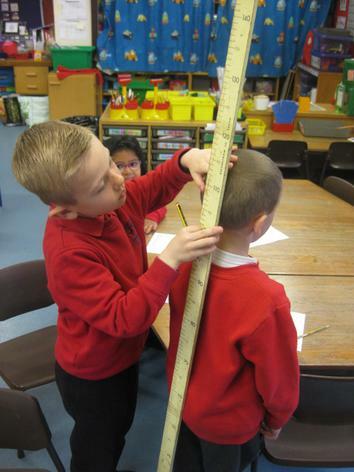 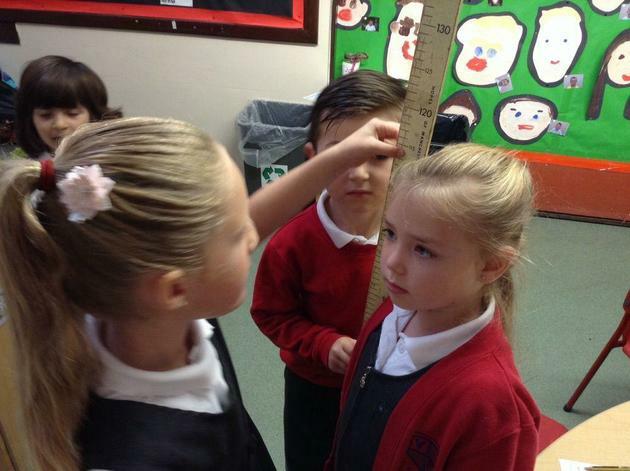 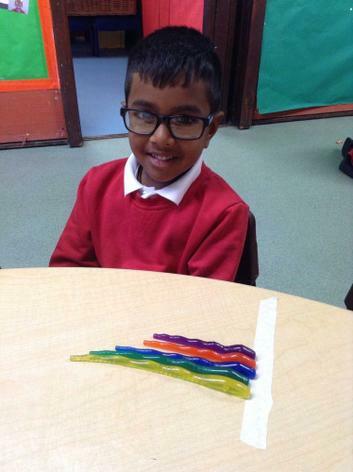 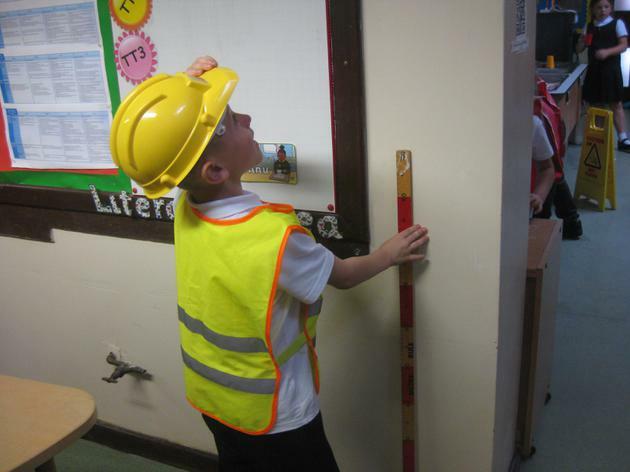 Our maths focus was measuring length. 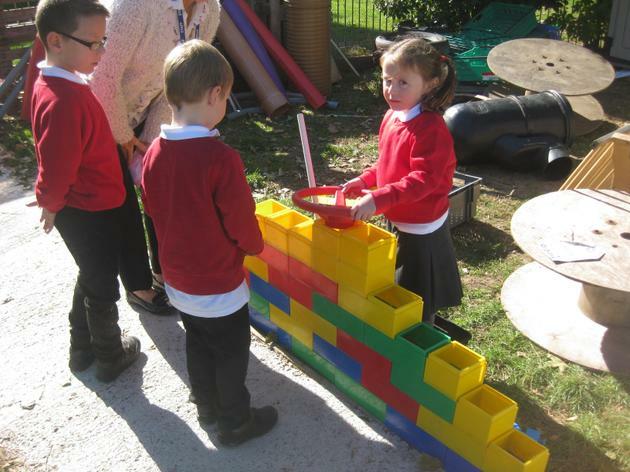 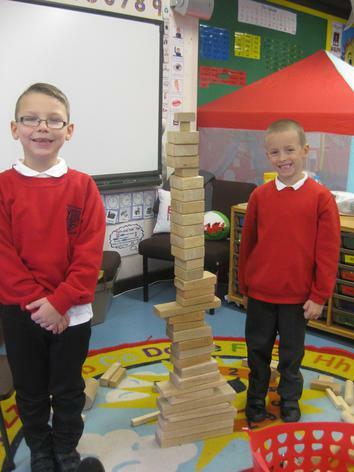 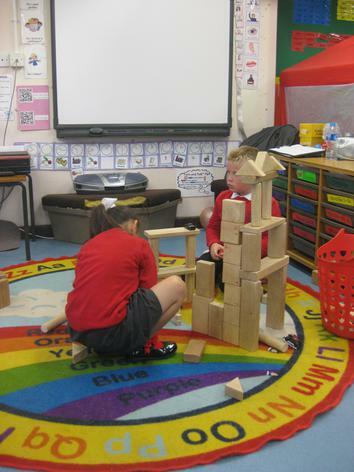 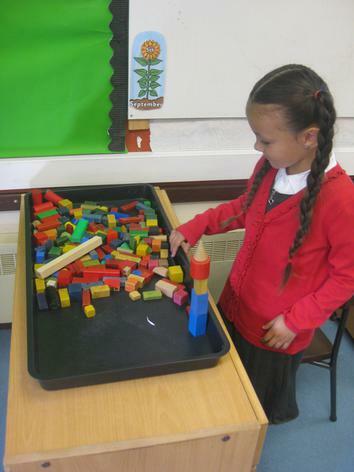 Some of the children worked on comparing and ordering lengths, whilst others went on to measure length with non-standard (cubes) and standard (cm) measures. 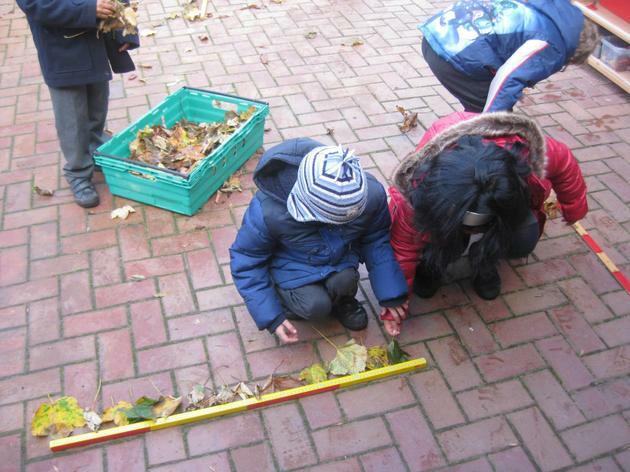 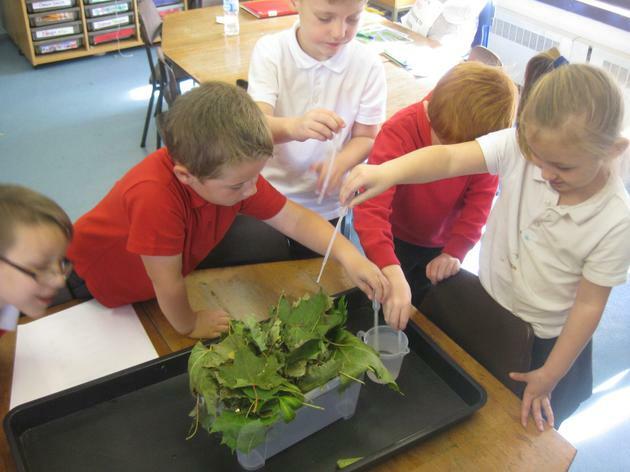 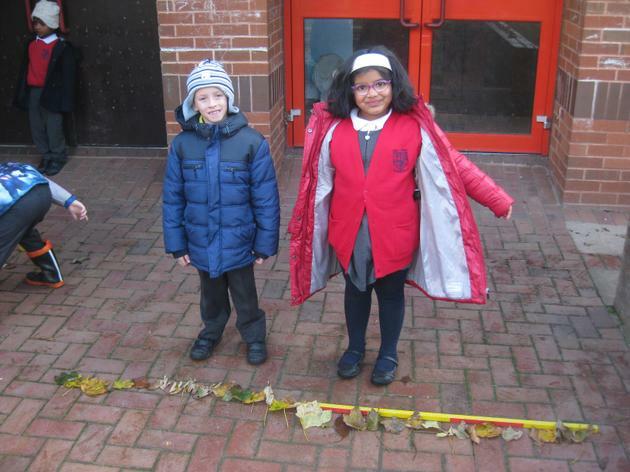 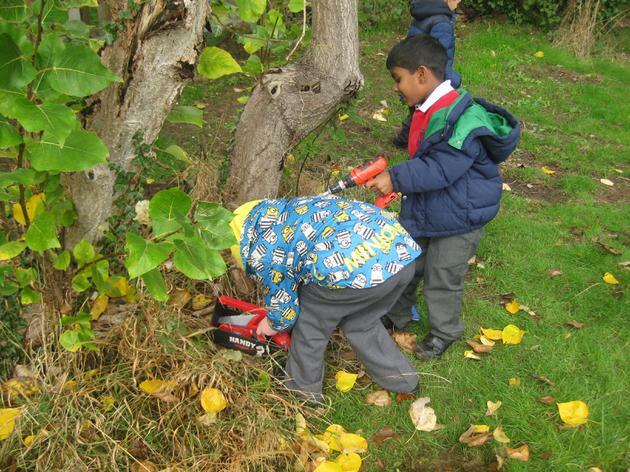 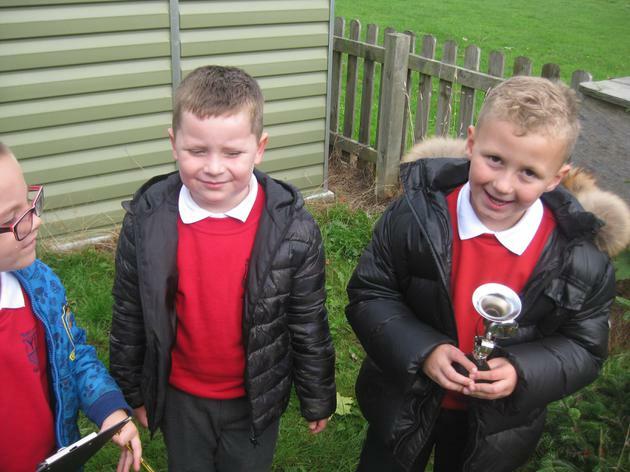 We measured leaves, pipes, worms and each other! 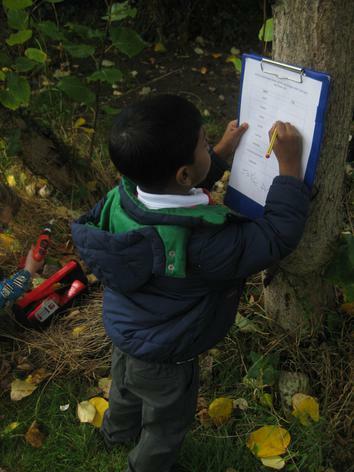 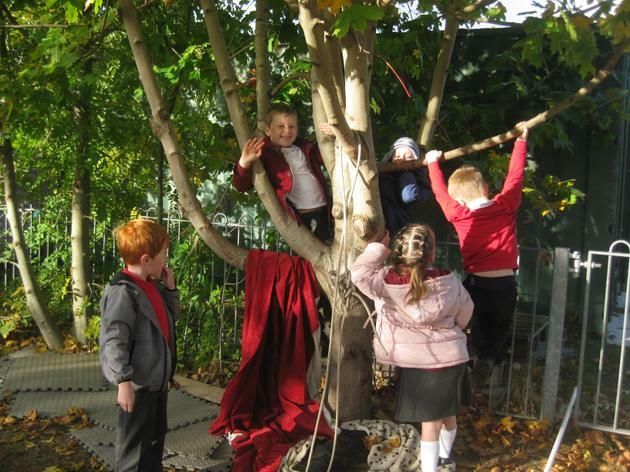 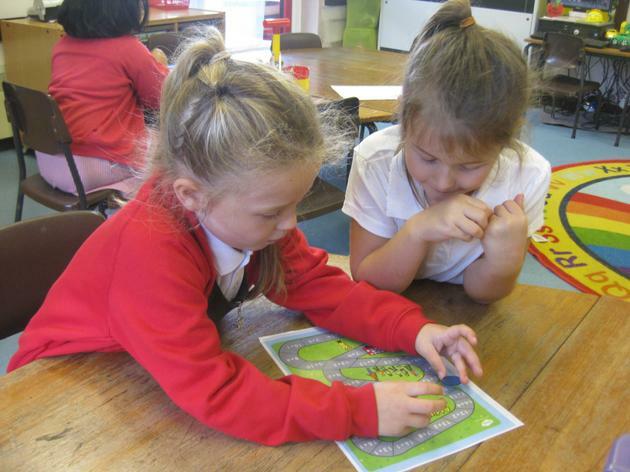 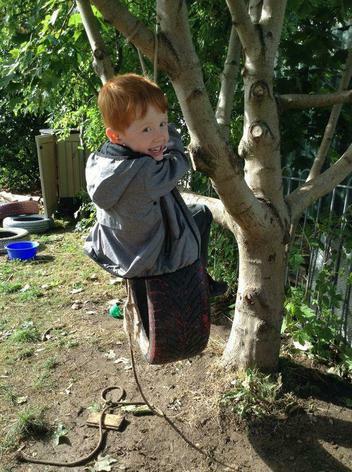 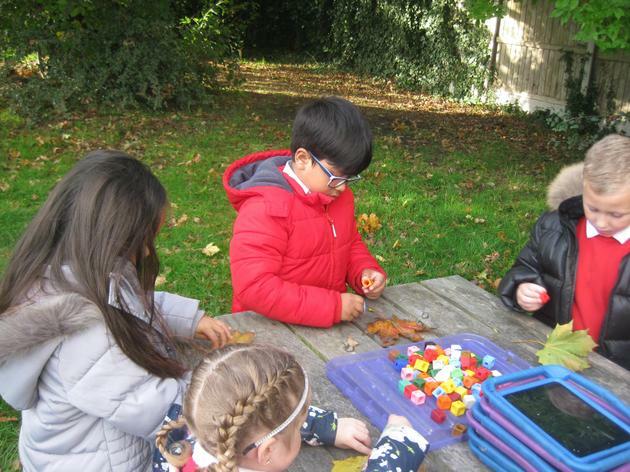 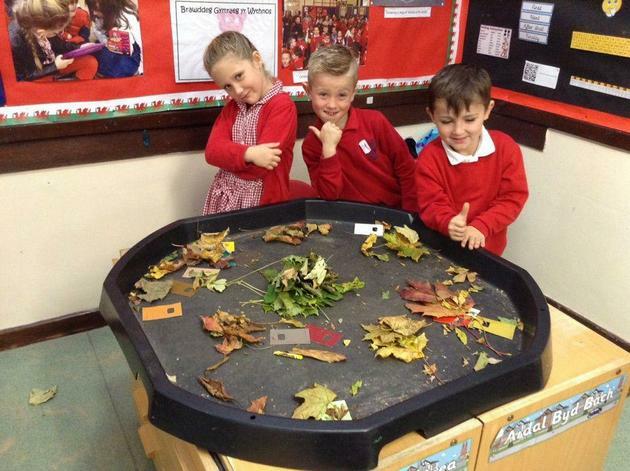 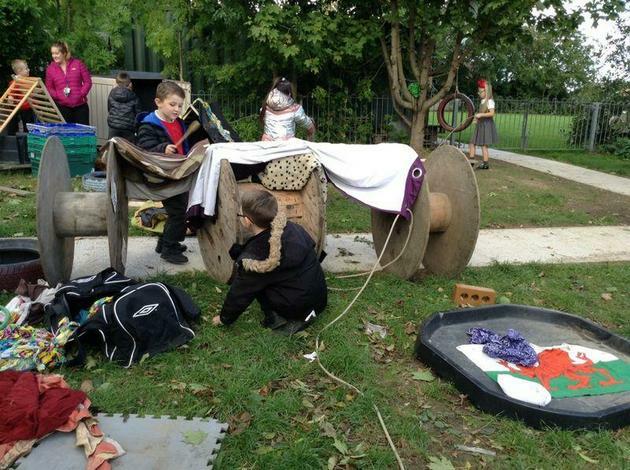 In Welsh, we played games with the leaves by responding to 'Ga i dail coch/brown/melyn/oren?' 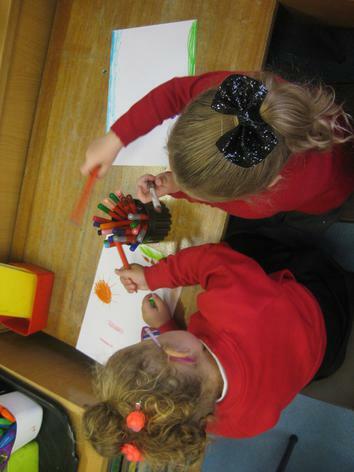 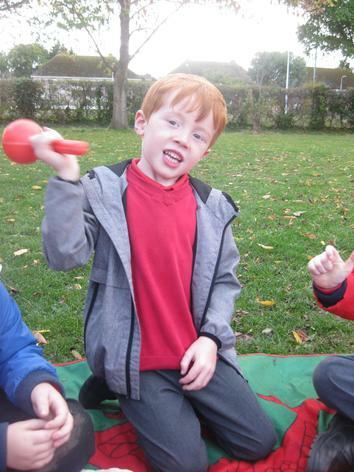 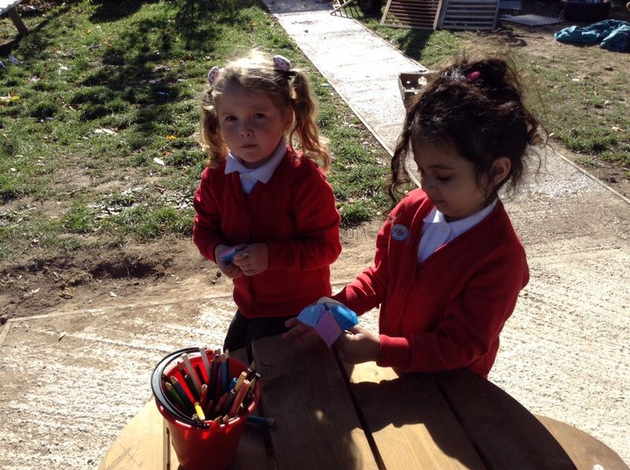 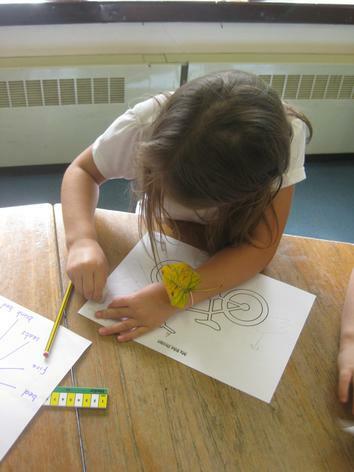 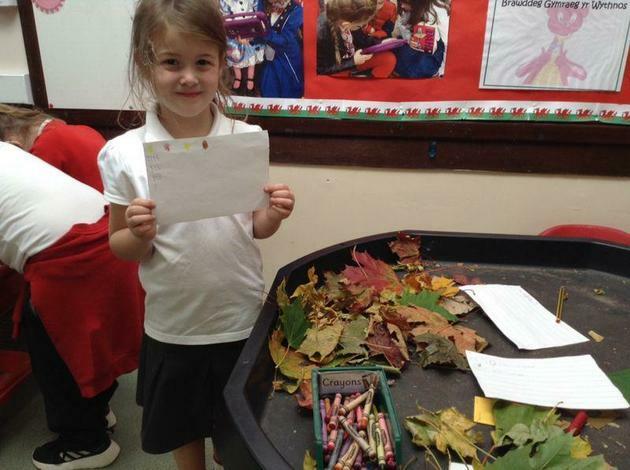 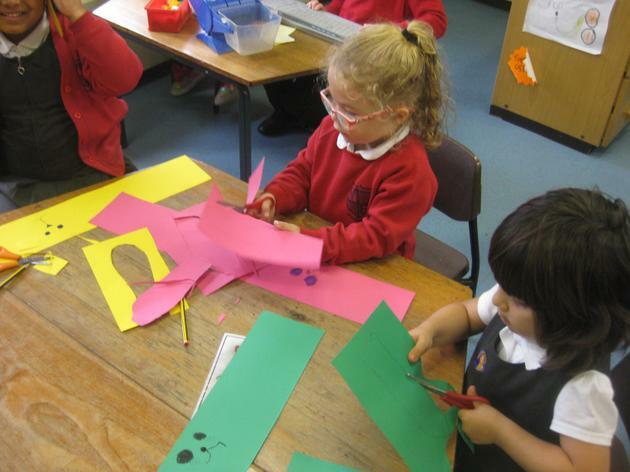 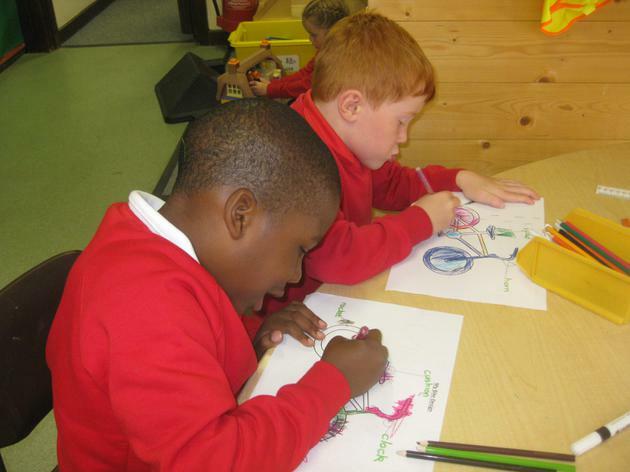 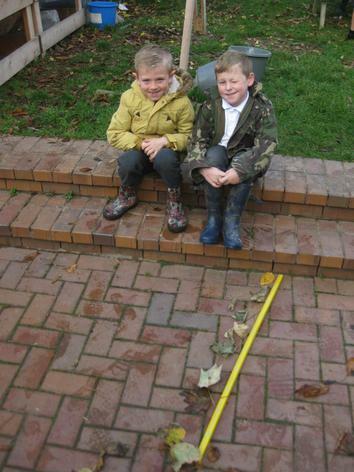 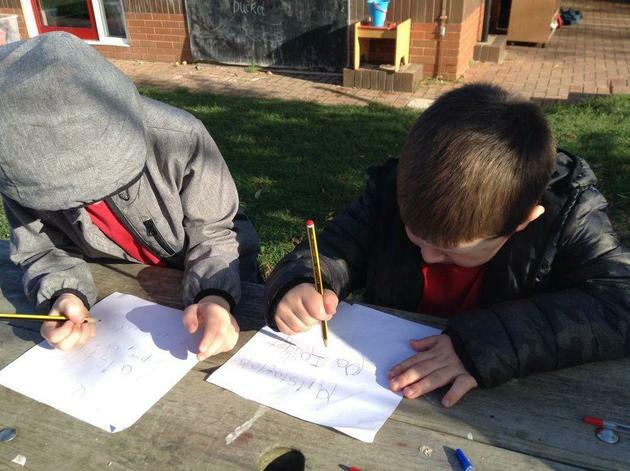 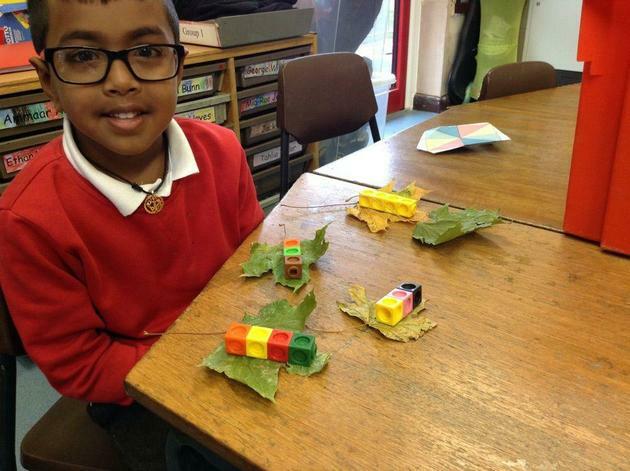 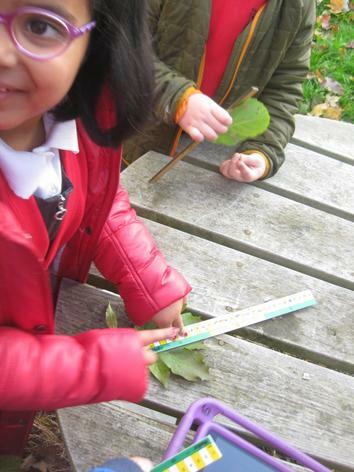 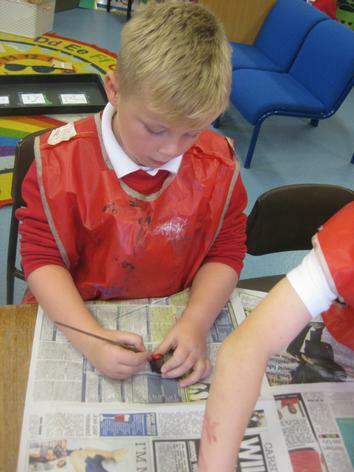 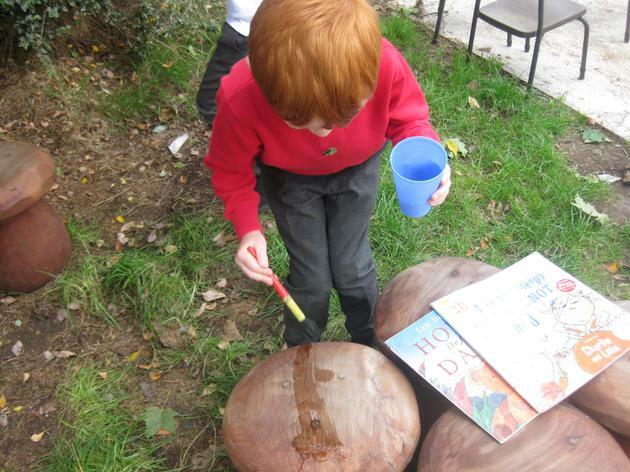 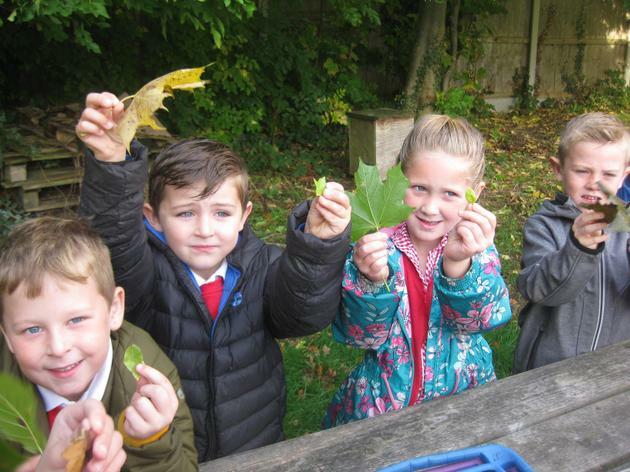 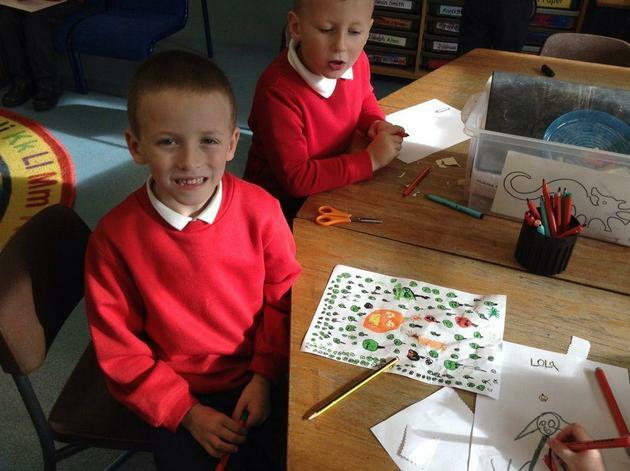 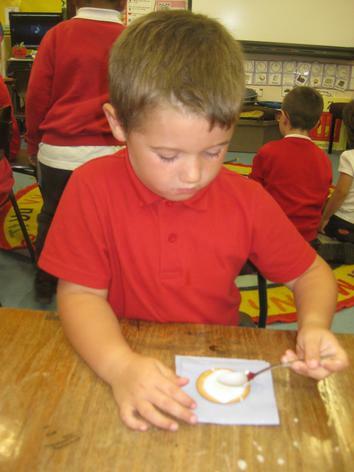 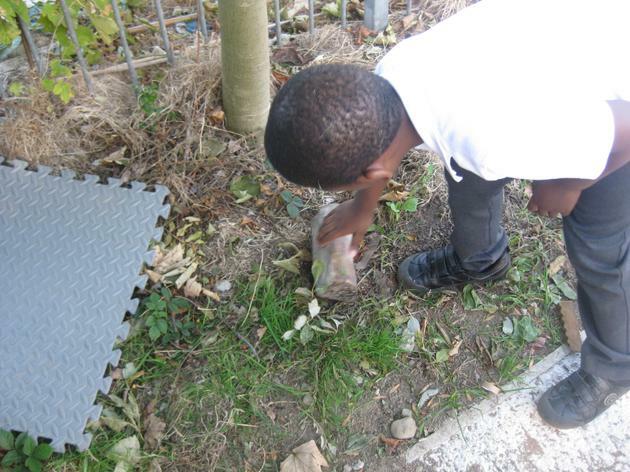 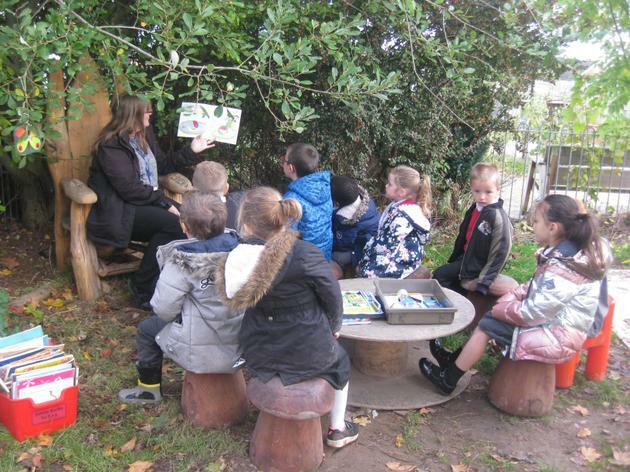 We then collected leaves for Golden Time and we painted and printed with them. 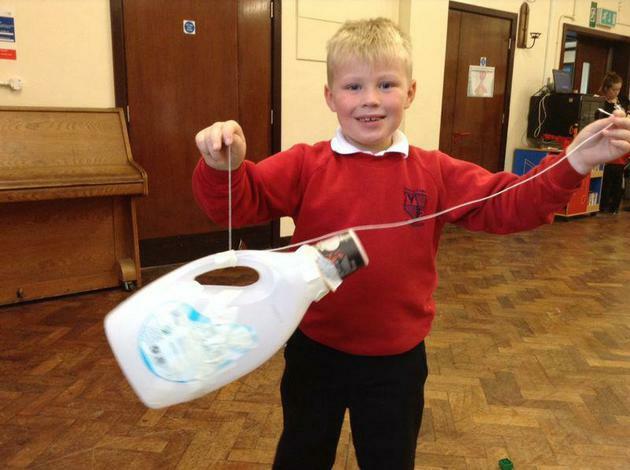 This week we have been thinking about the problem with plastic. 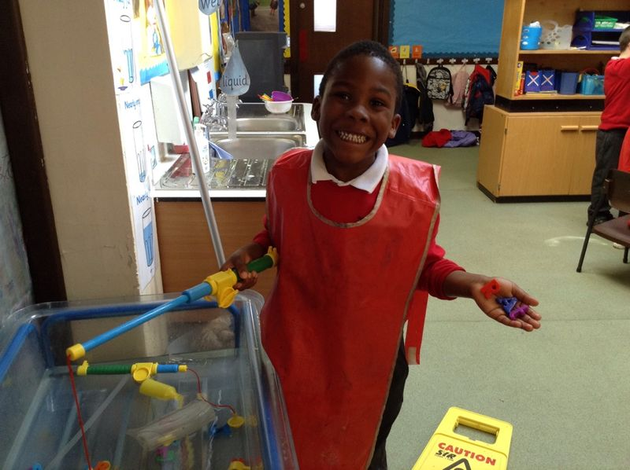 We talked about how useful plastic is and what we use it for in our everyday lives. 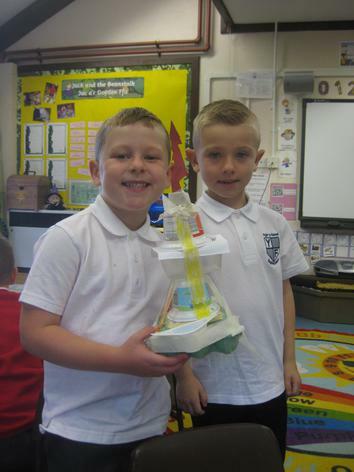 We watched a Newsround clip that showed the 'plastic islands' in the ocean near the Caribbean. 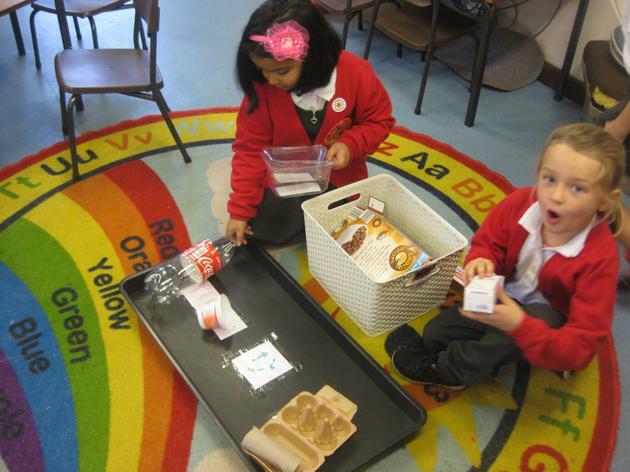 We discussed the problems that plastic in the ocean can cause for fish and other sea life. 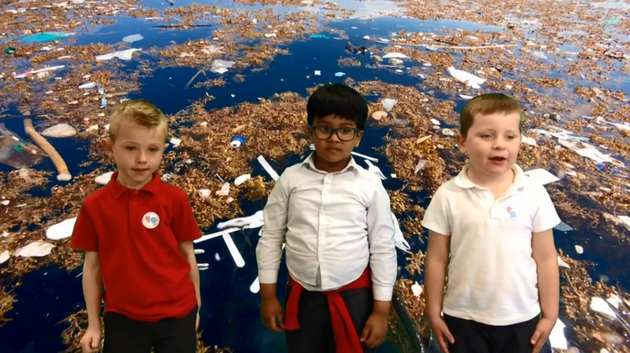 We decided to create videos against the green screen to tell people about the problem with plastic and how we can help. 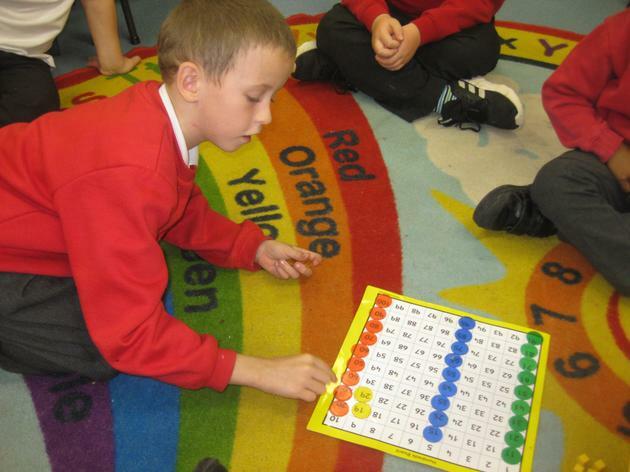 In maths this week we looked at odd and even numbers. 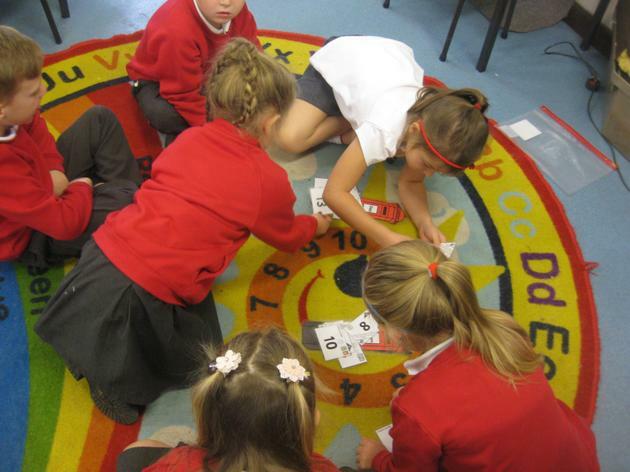 We sang a song to help us remember which numbers are odd and which are even. 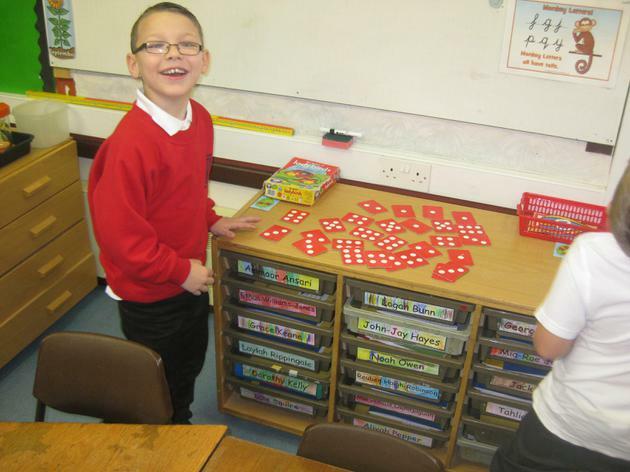 We went on to sort 2 digit odd and even numbers. 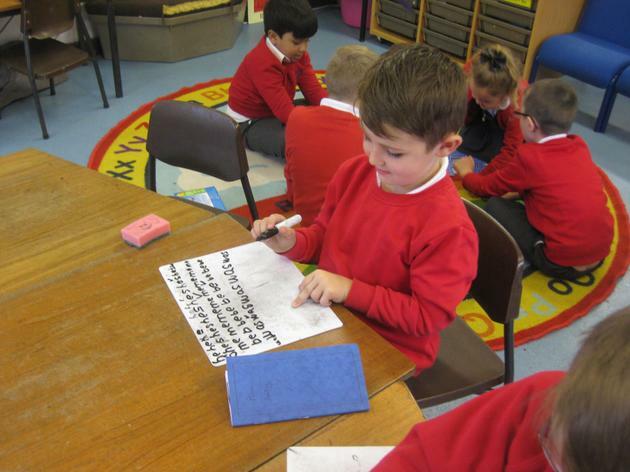 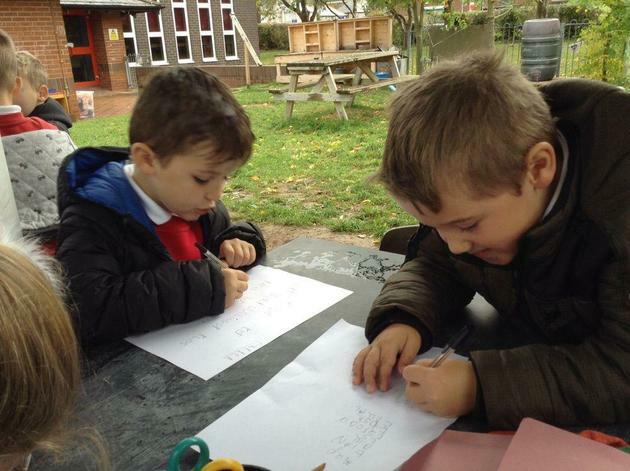 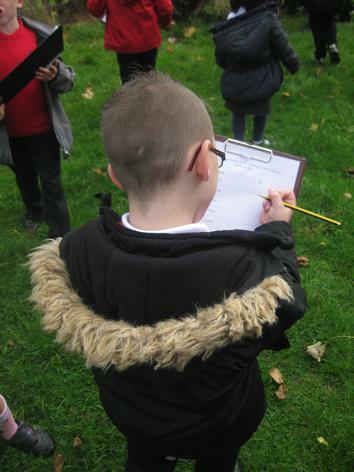 Some of the year 2 pupils went on to sort calculations by their answers. 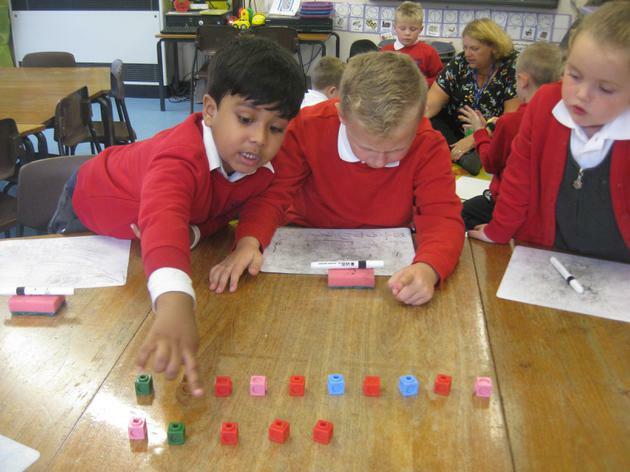 We also looked at times and divide in maths this week. 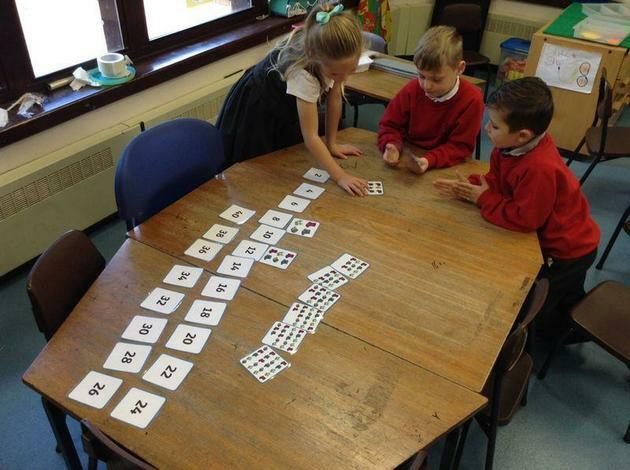 We worked very practically to introduce the concept and focused on times and divide by 2. 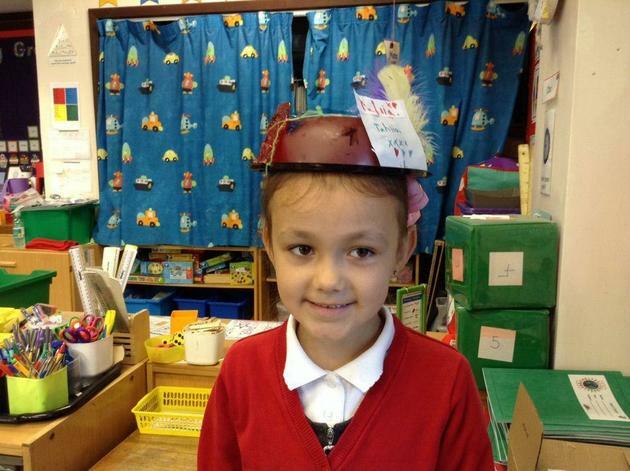 On Friday we made hats to wear to the Jambori next week. 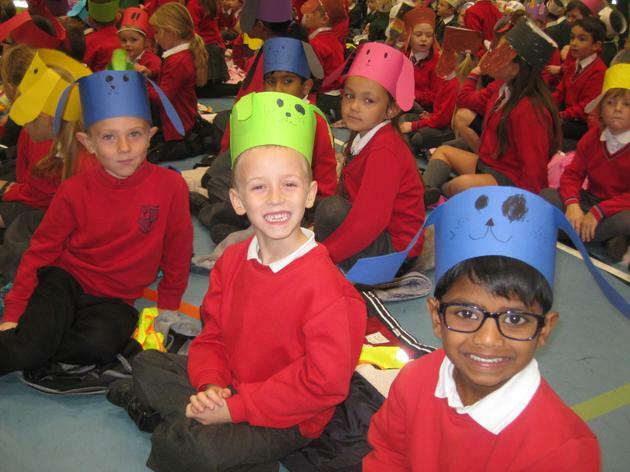 We voted for our favourite song and made hats to match the song! 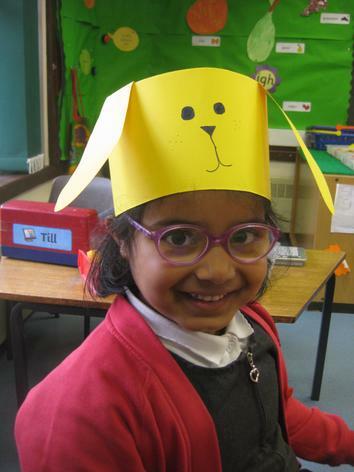 We voted for 'Dau Gi Bach' and made dog hats. 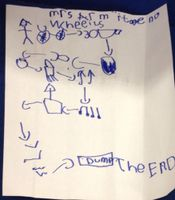 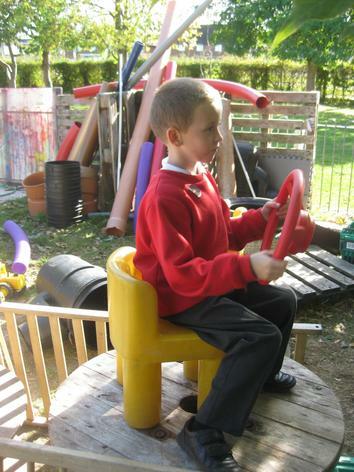 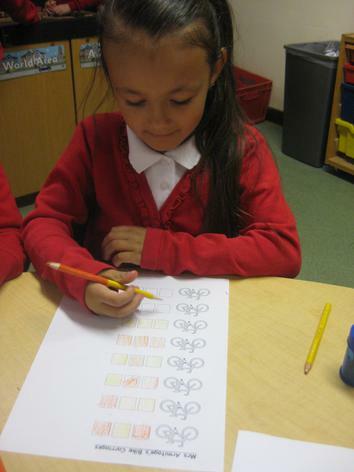 This week we started our Talk for Writing project using the story of 'Mrs Armitage on Wheels'. 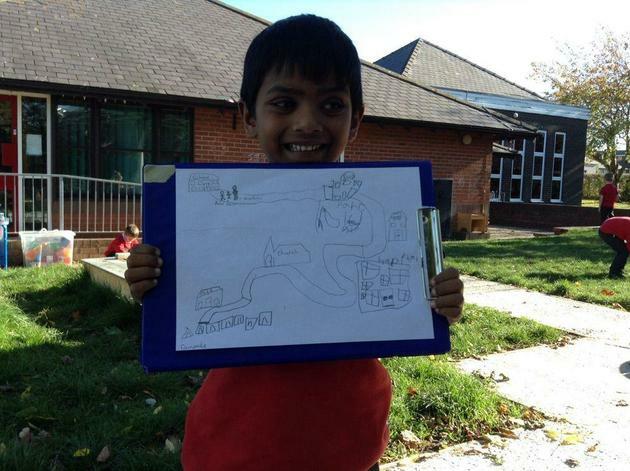 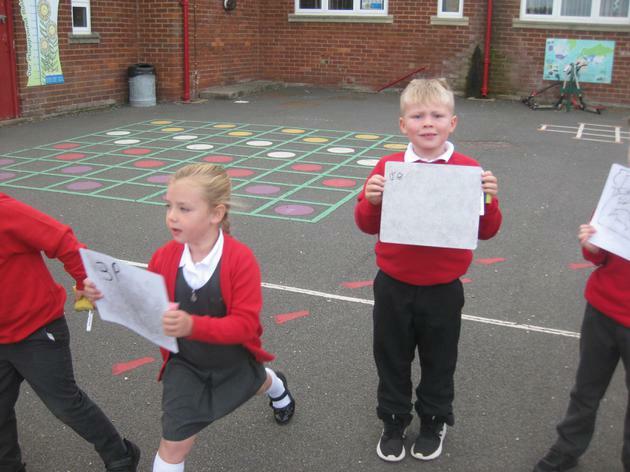 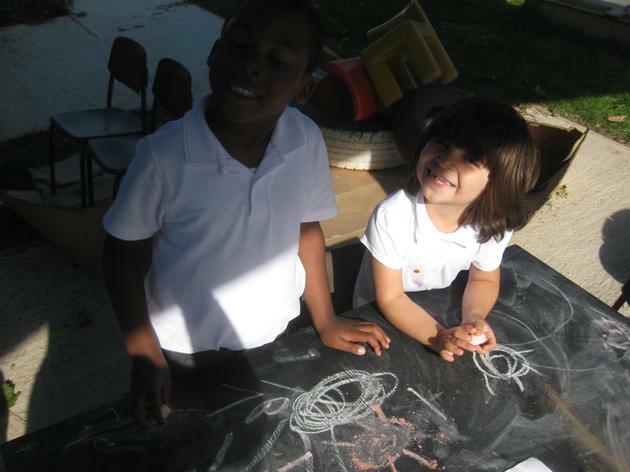 As a class we drew a story map and added actions to the story. 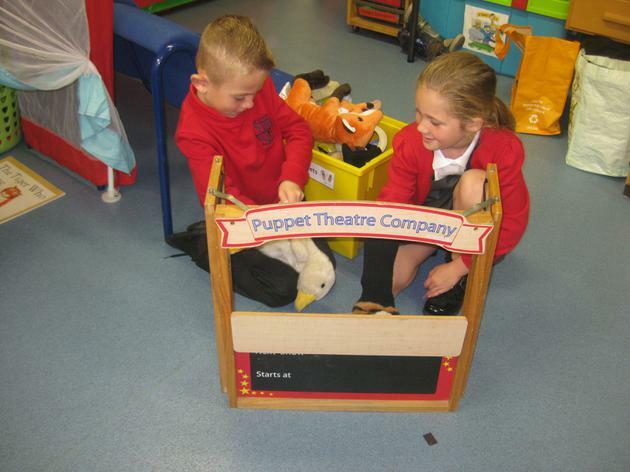 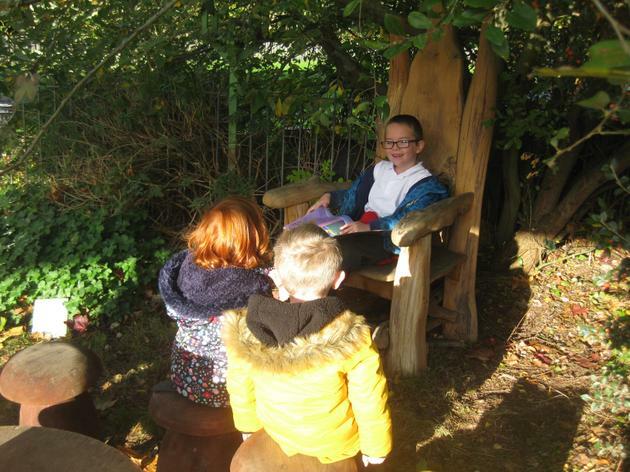 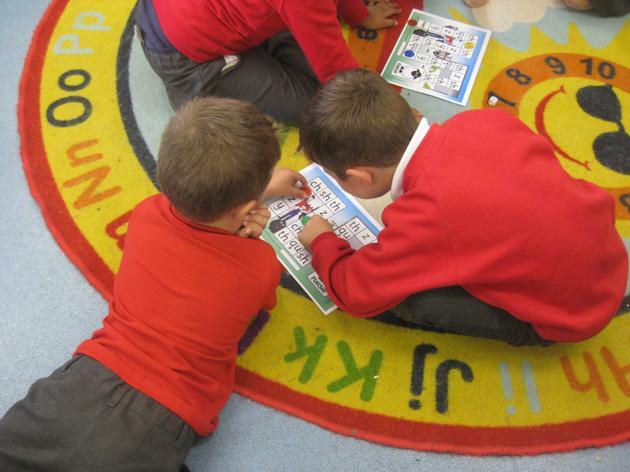 We have started to retell the story as a group. 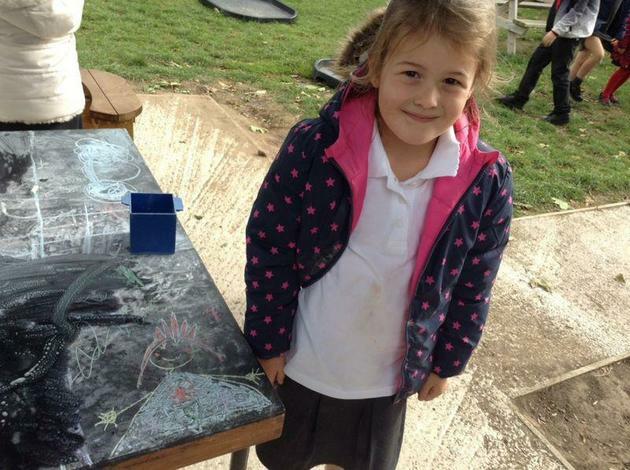 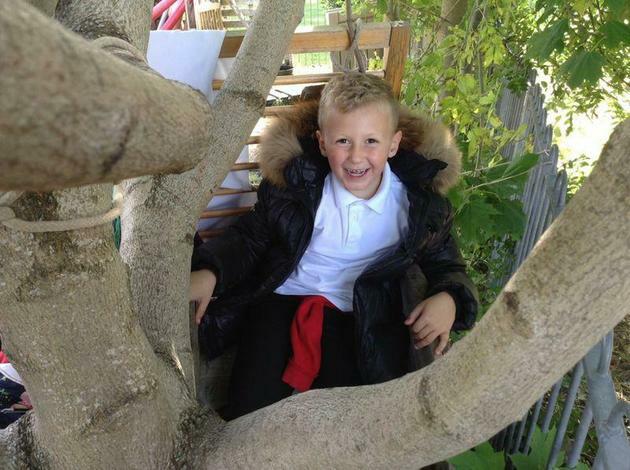 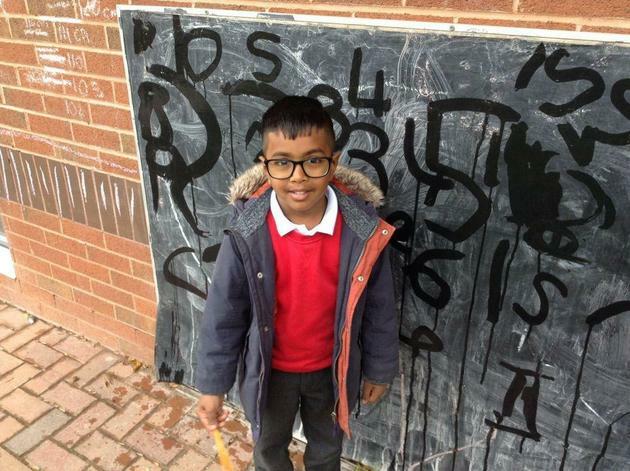 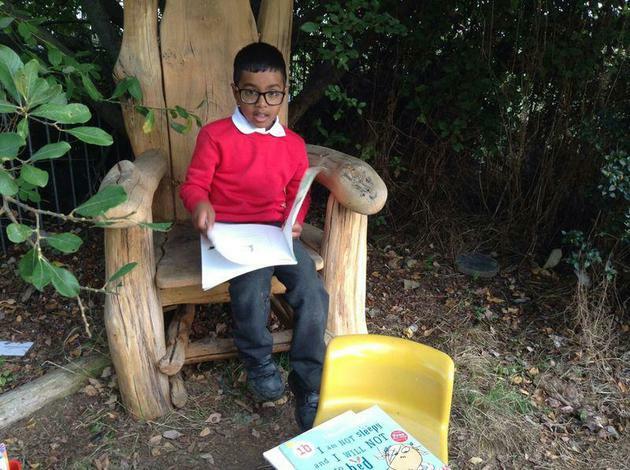 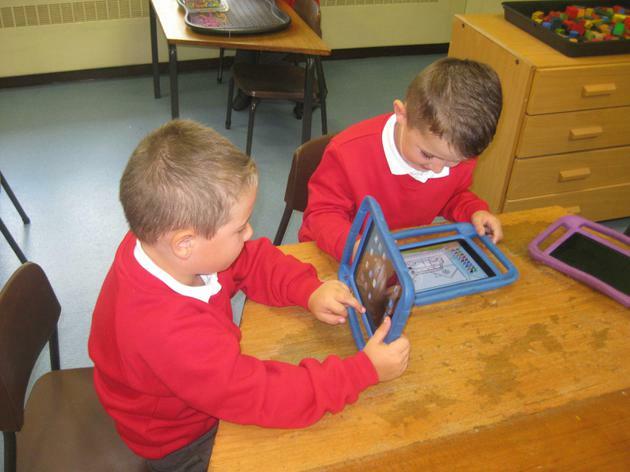 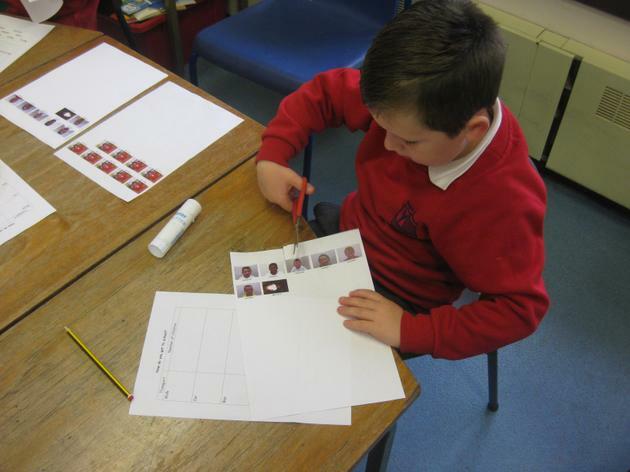 Following on from this we had to put pictures from the story into the correct order, and next week some of us will be adding keywords or simple sentences to the pictures. 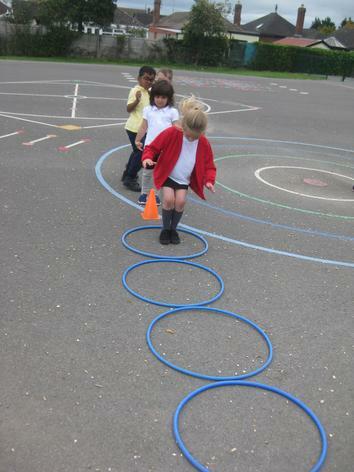 In maths our focus for the week has been counting in steps of 2,5 and 10. 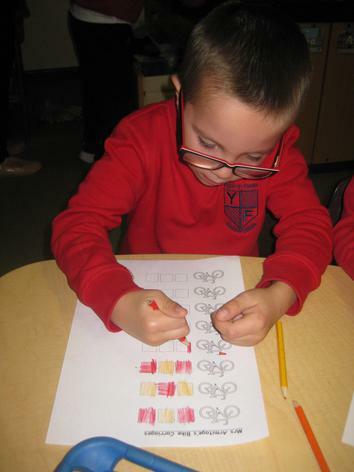 We started with 2s and used a number square to see how when we count in 2s we skip over every other number. 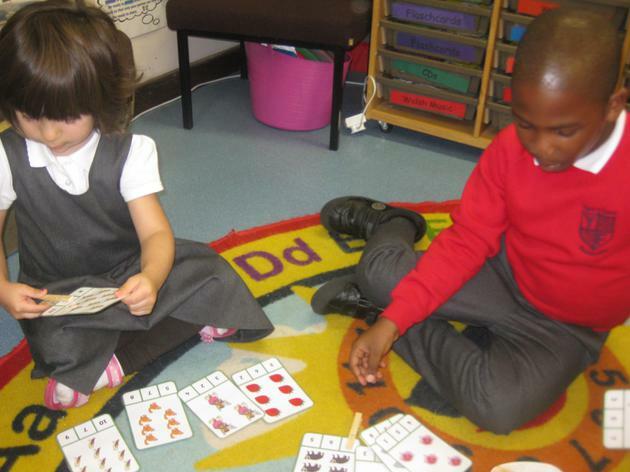 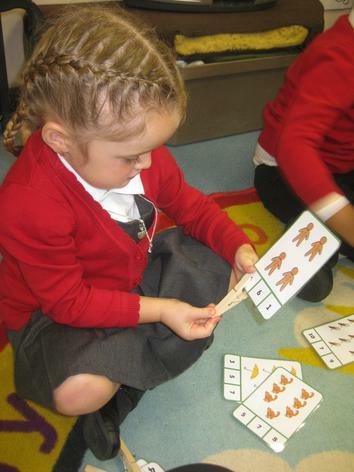 The children are able to count in 2s to 20 fantastically and now we need to push this further by counting in 2s to 100. 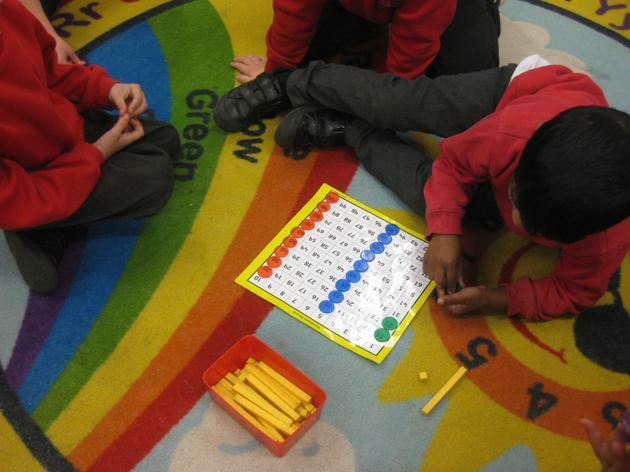 We moved on to counting in 5s by Wednesday and then 10s by Friday. 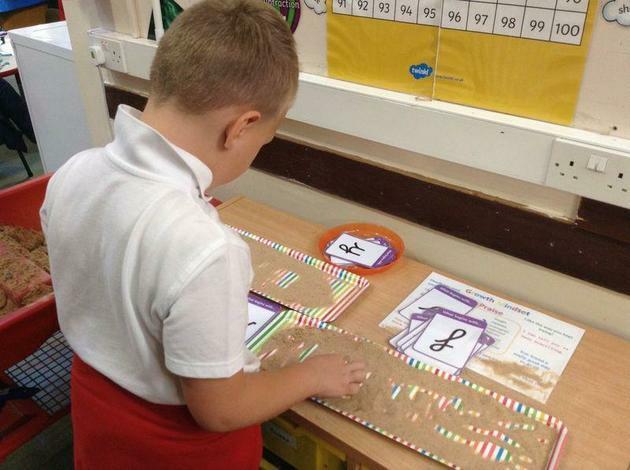 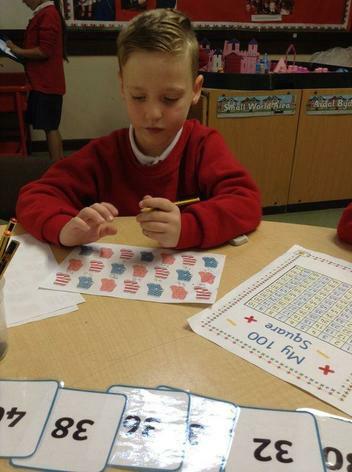 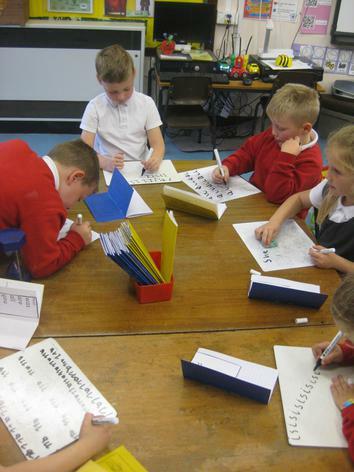 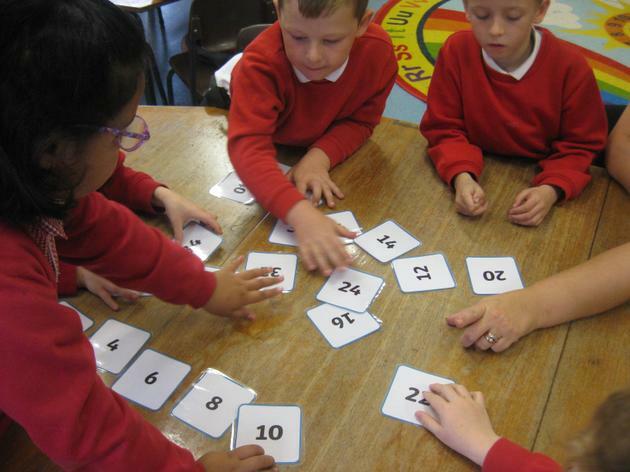 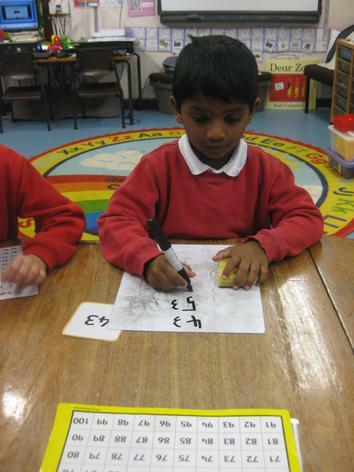 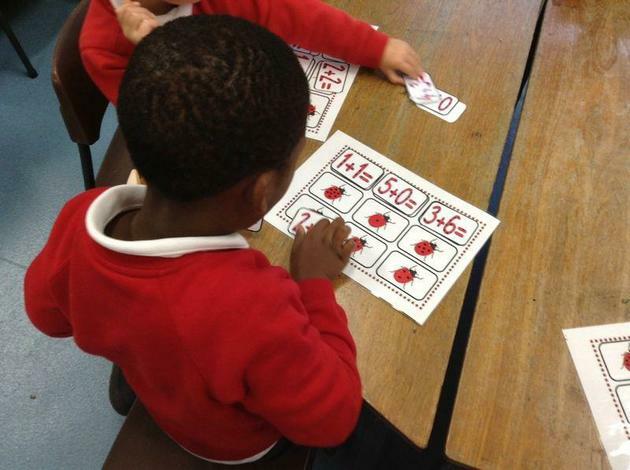 Some of the Year 1 and 2 pupils developed their counting in 10s from starting at 10, to starting at any given number. 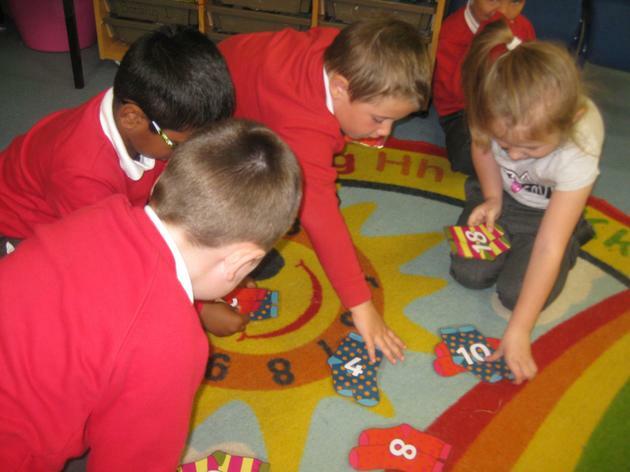 We looked at the tens and units and noticed that when we count in 10s, only the tens digit changes. 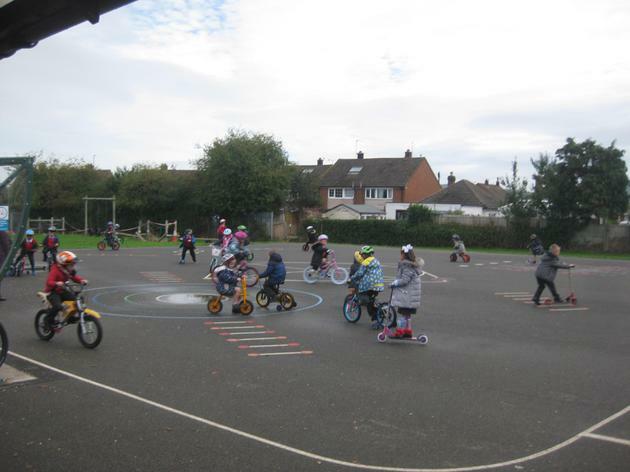 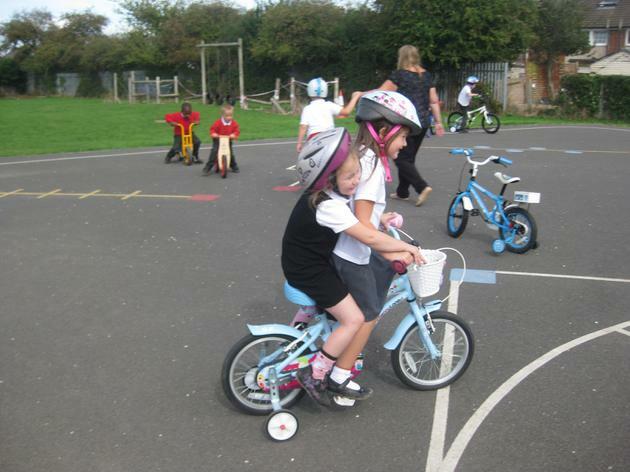 When we originally read 'Mrs Armitage on Wheels' some of the children were shocked that when Mrs Armitage broke her bike, she sent it to the dump! 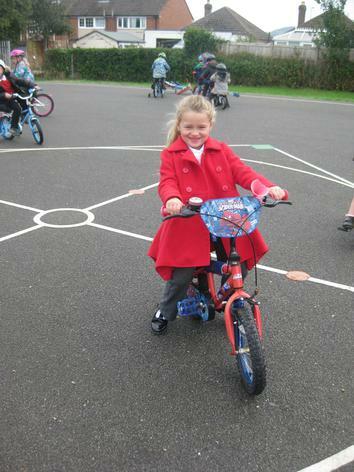 This week we started looking at what else Mrs Armitage could have done with her bike to help reduce the amount of rubbish that is sent to landfill. 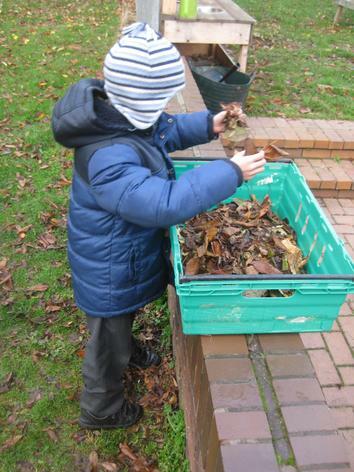 We will be continuing to look at recycling next week. 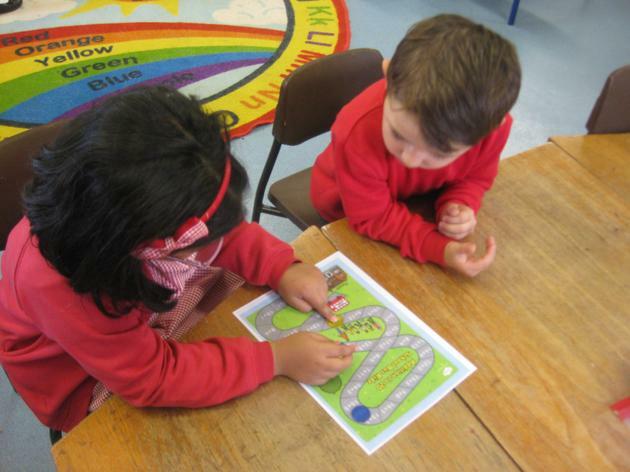 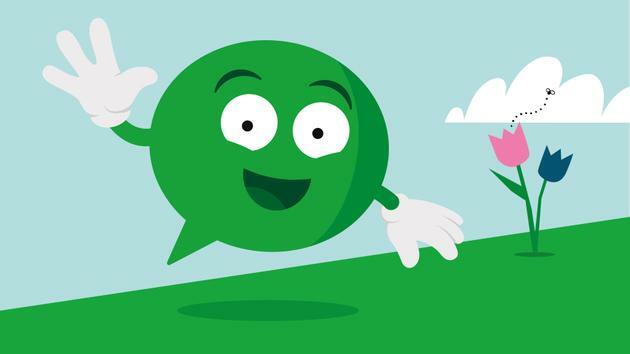 Over the last couple of weeks, we have been using our Welsh lessons to become familiar with the Helpwr Heddiw routine and practising responding to simple Welsh questions such as 'Sut wyt ti?' 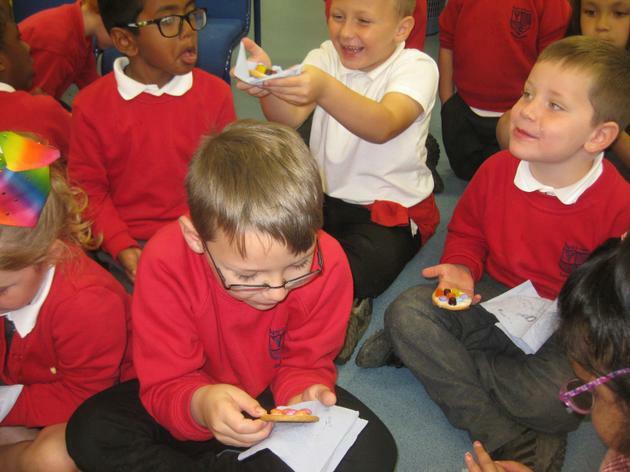 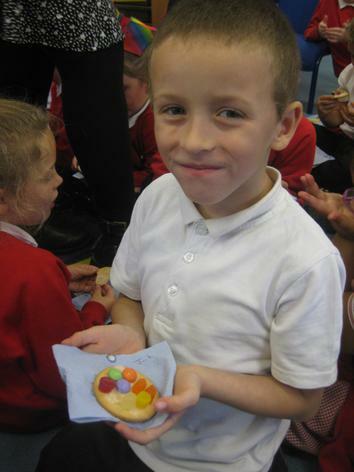 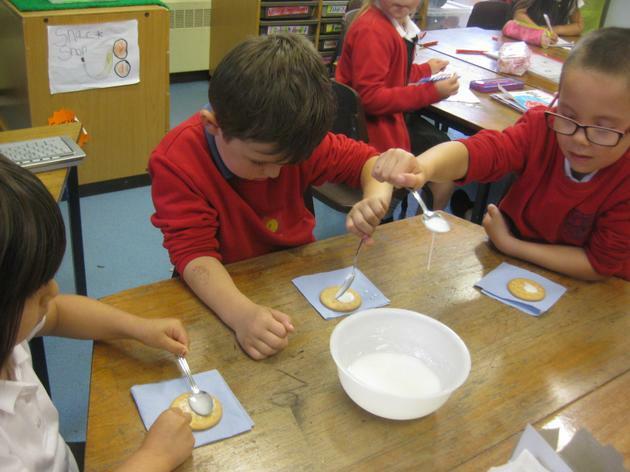 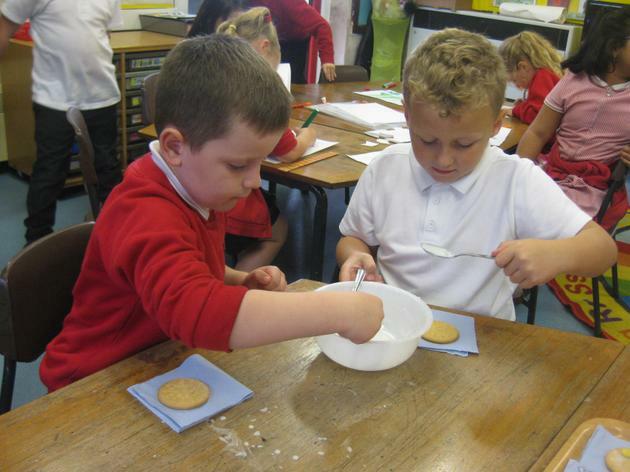 For Golden Time this week we created bisgedi hapus (happy biscuits) using plain biscuits, icing and decorations. 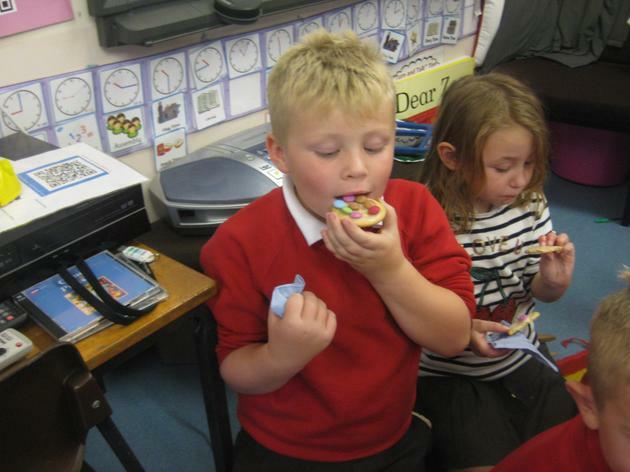 Then we ate them all up! 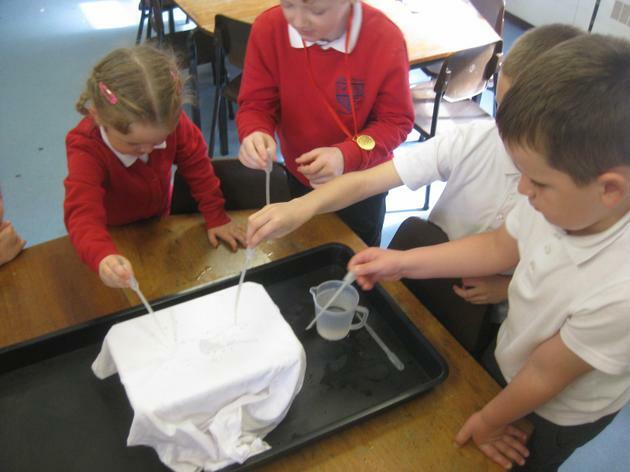 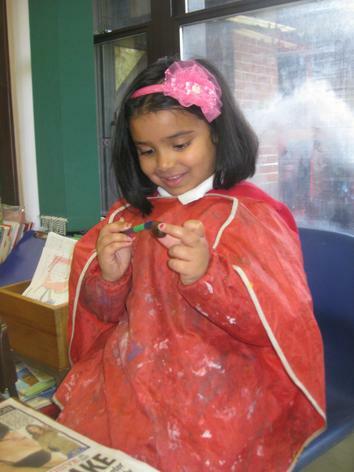 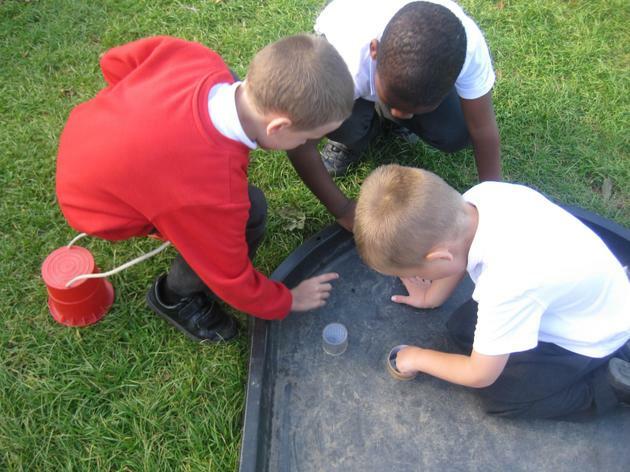 This week we have been learning all about waterproof materials. 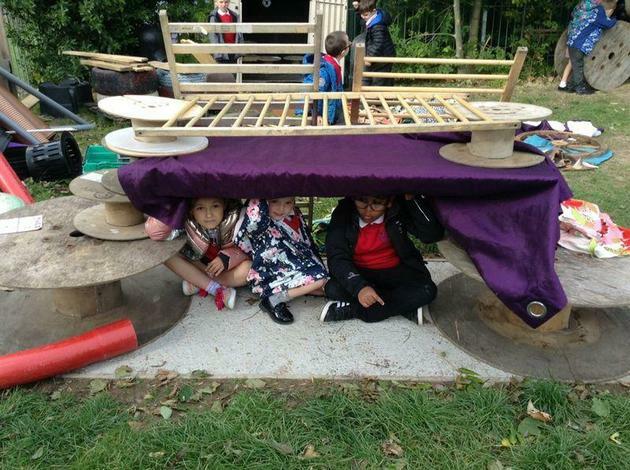 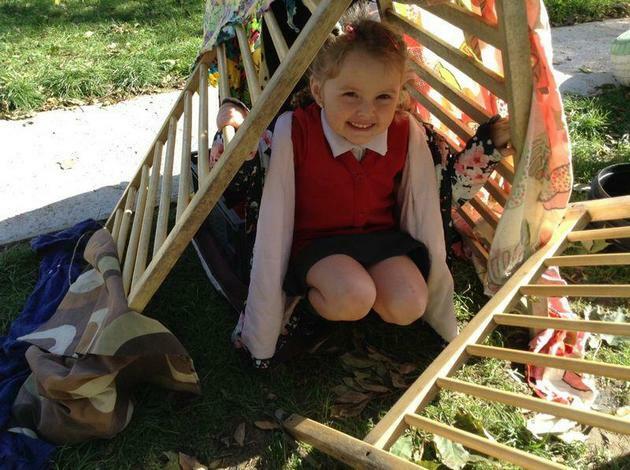 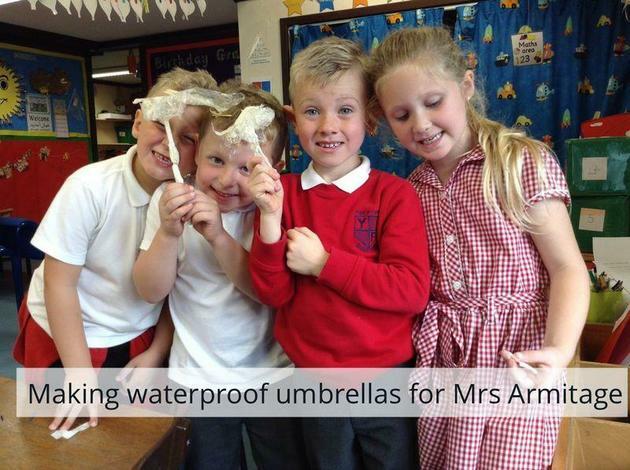 Mrs Armitage needed our help to make a new umbrella after hers got broken in one of her crazy inventions! 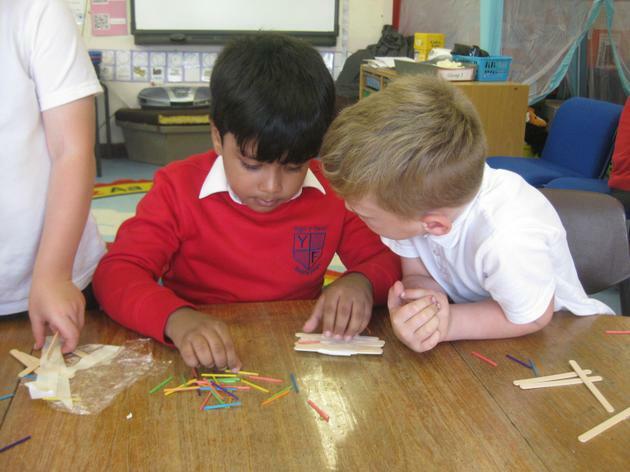 We tested a variety of materials to find out which would be the most suitable. 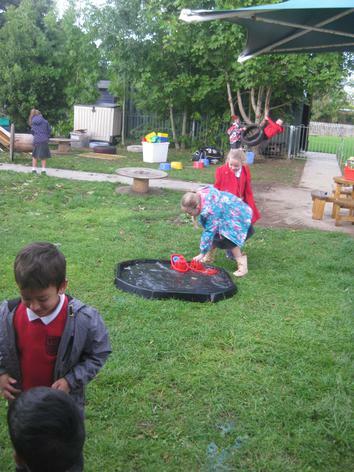 We decided that out of the four materials we tried, plastic was the most waterproof. 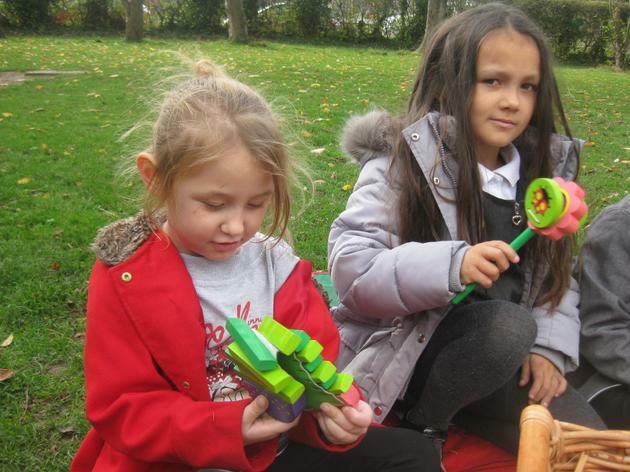 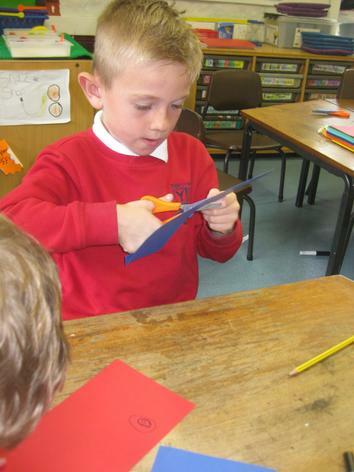 Some of us went on to make mini umbrellas with a partner. 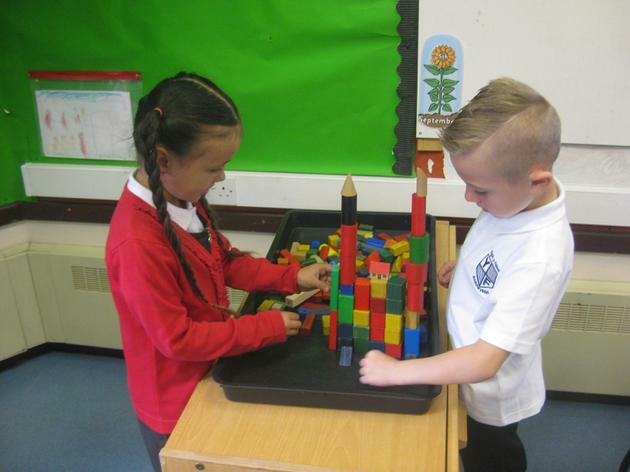 It was really tricky and we had to make sure we worked well with our partner to solve the problems presented. 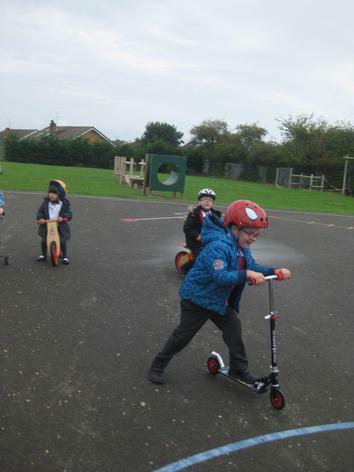 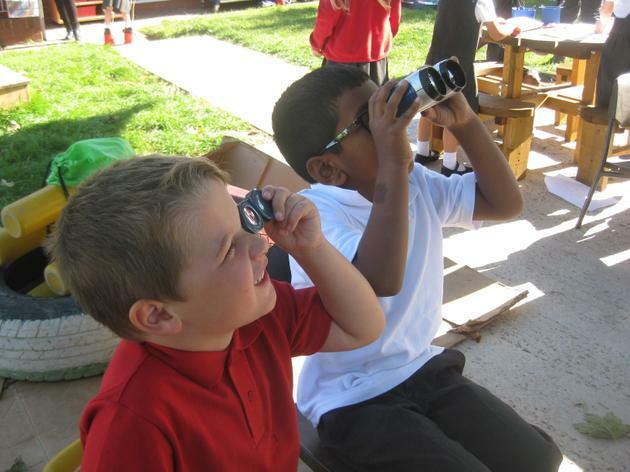 We also looked carefully at all the things that Mrs Armitage put on her bike. 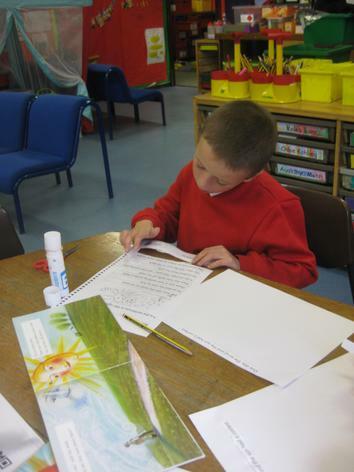 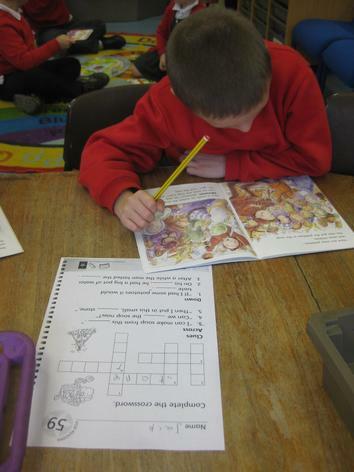 We used pictures from the book to write our own sentences using capital letters and full stops in the correct places. 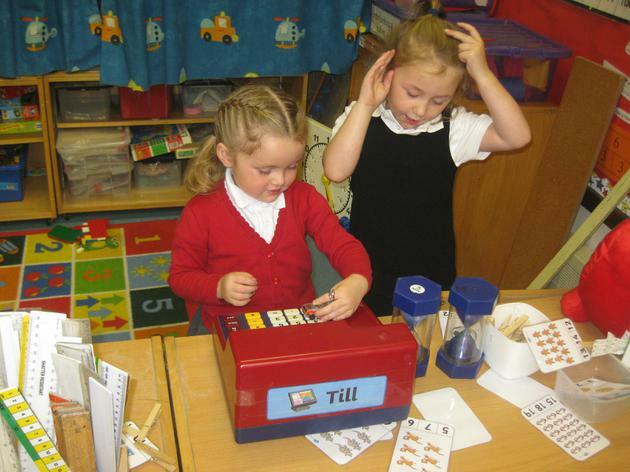 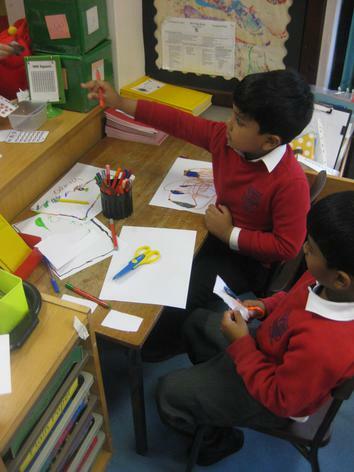 In the maths area, the children have shown a lot of interest in the till and money. 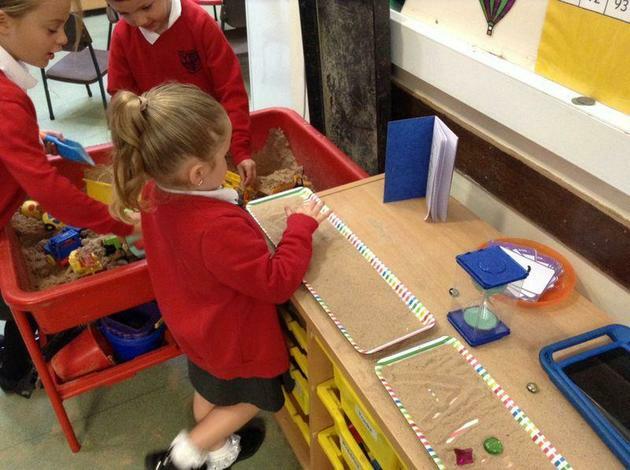 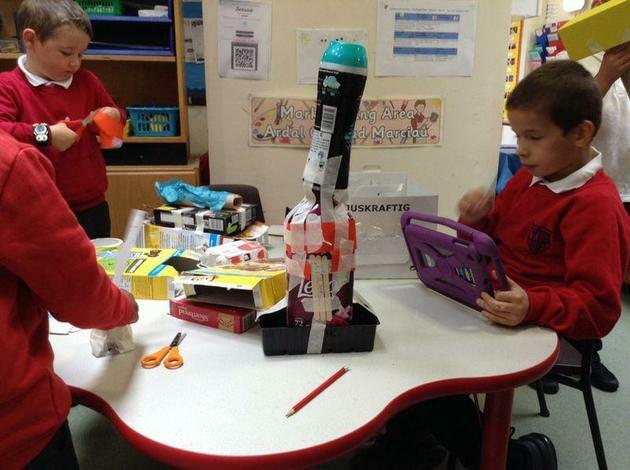 They have been making their own shops during choosing time. 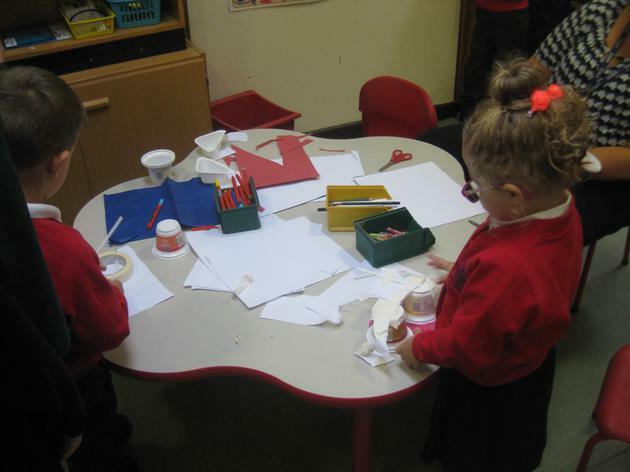 We decided that it would be a good idea to make our role play area into a snack shop. 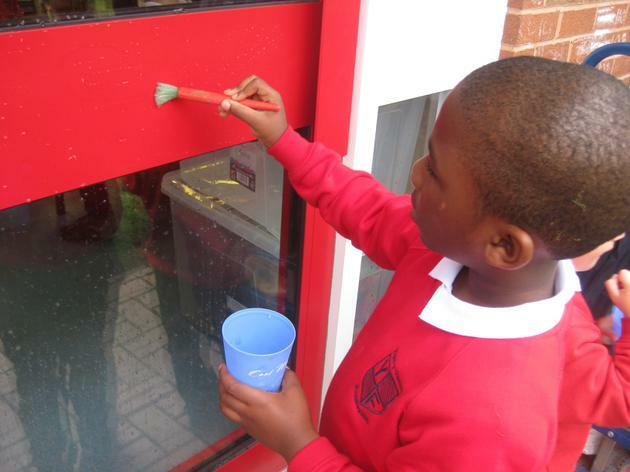 We have started collecting resources and painting items for the shop display. 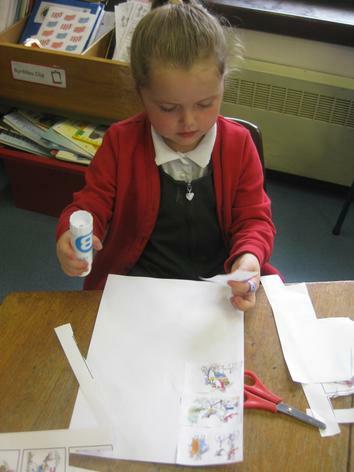 We will continue this next week. 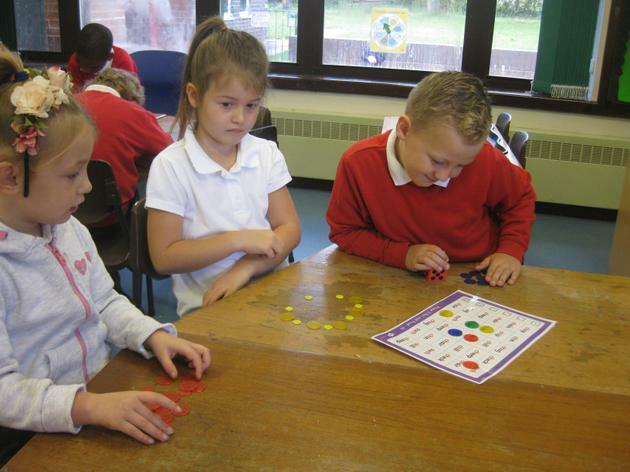 Our maths focus for the week has been subtraction. 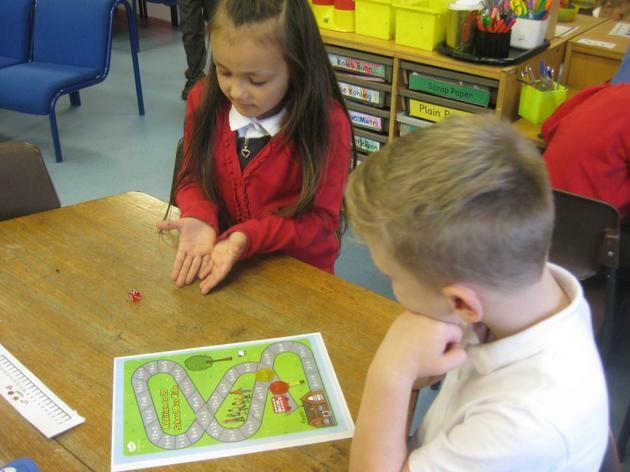 We have played lots of games to introduce the concept and revisit what we learnt last year. 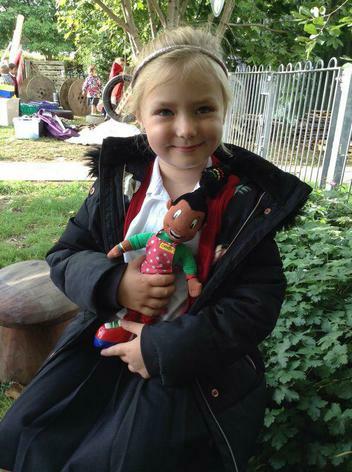 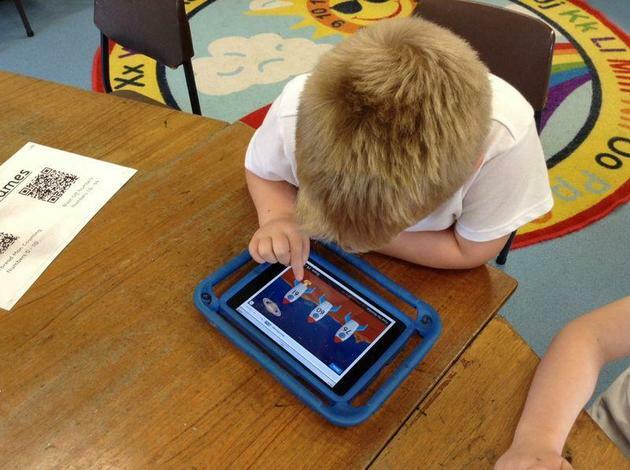 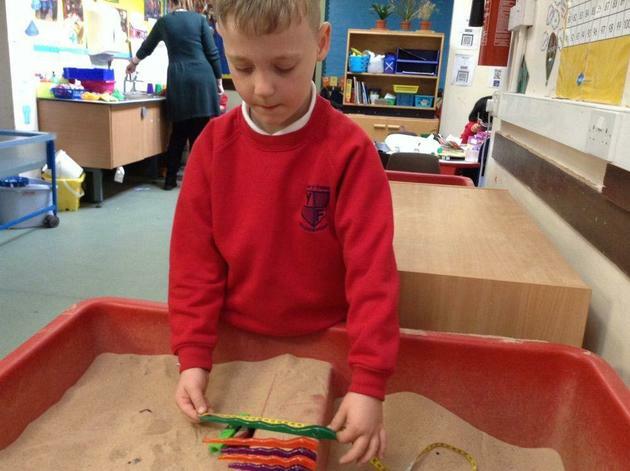 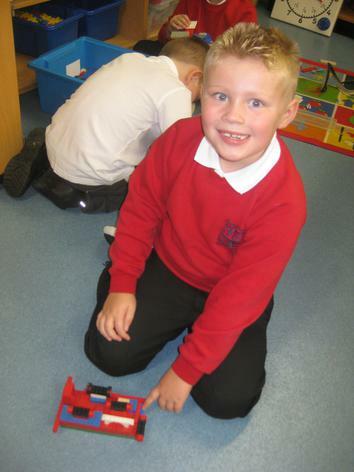 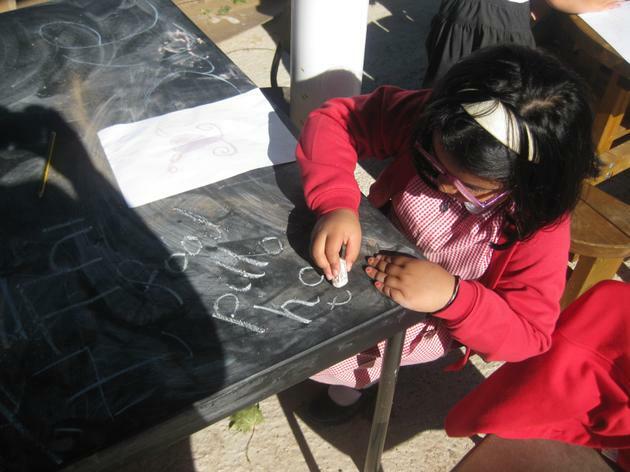 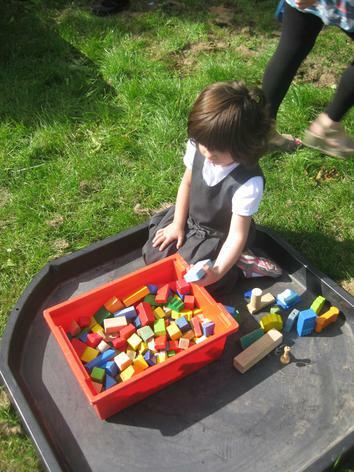 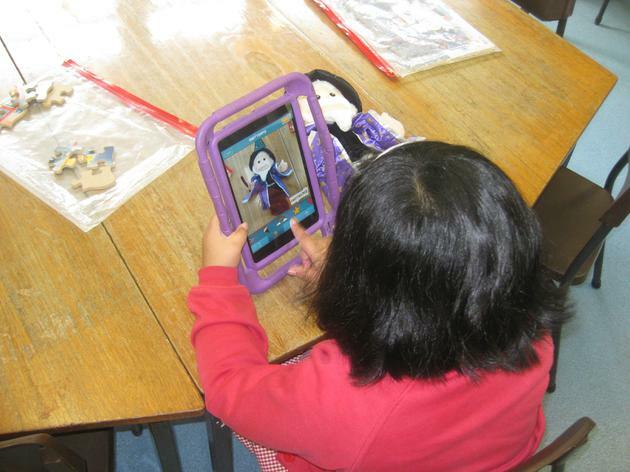 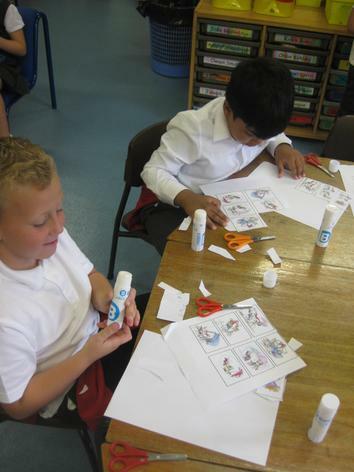 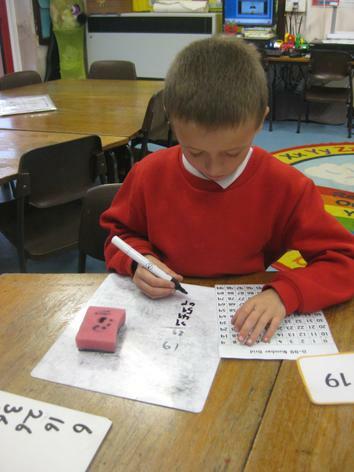 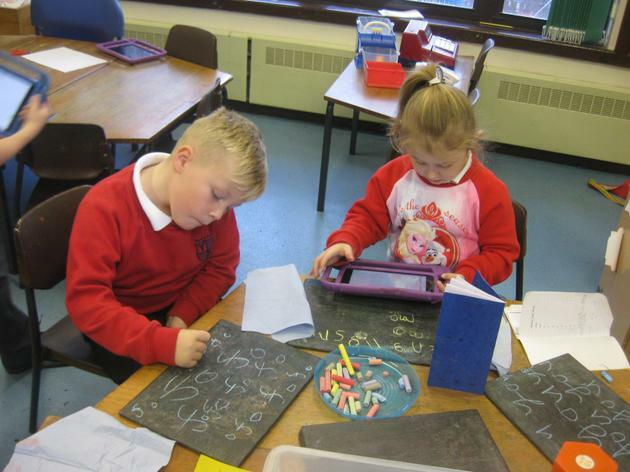 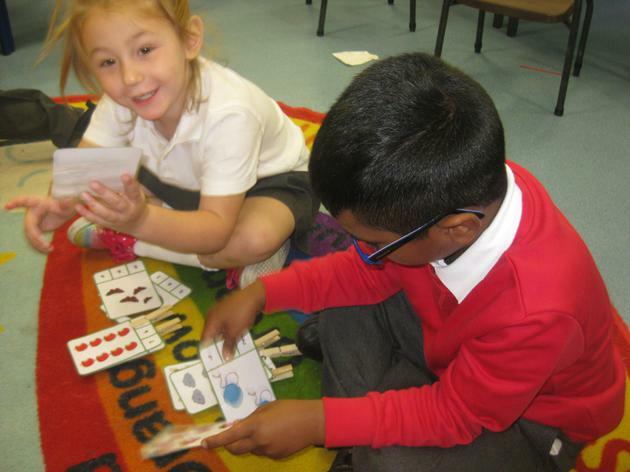 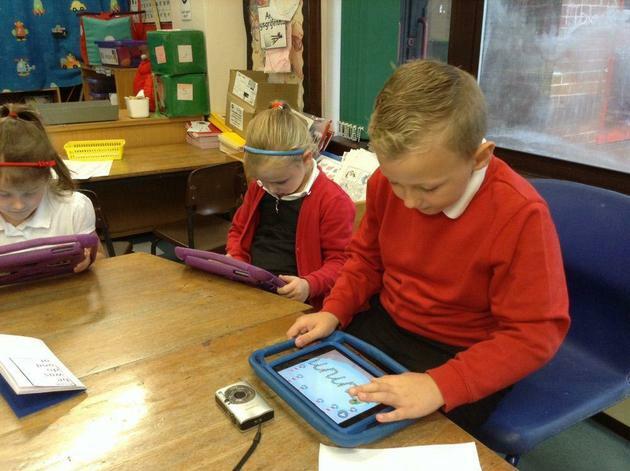 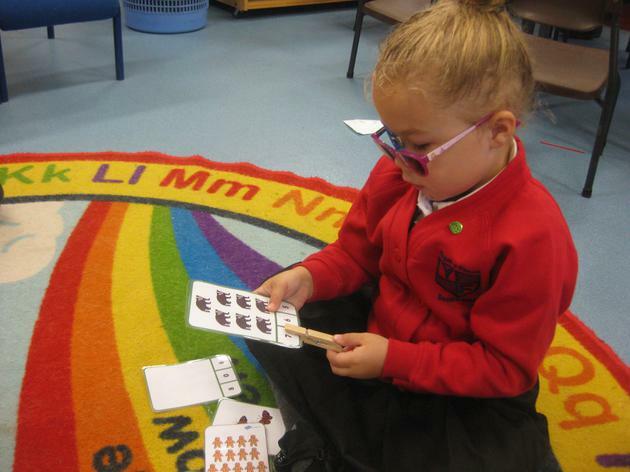 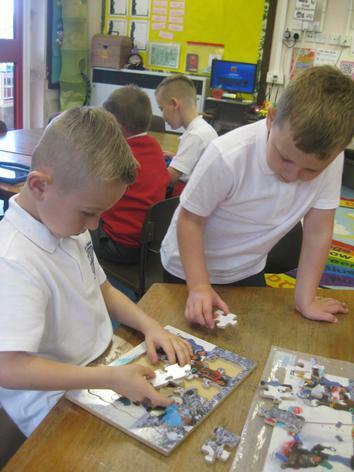 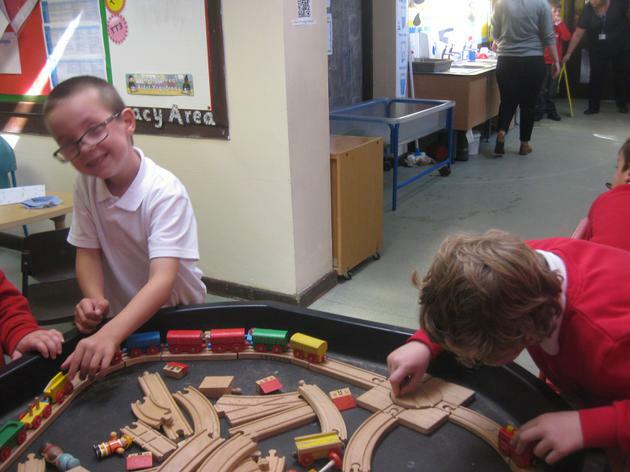 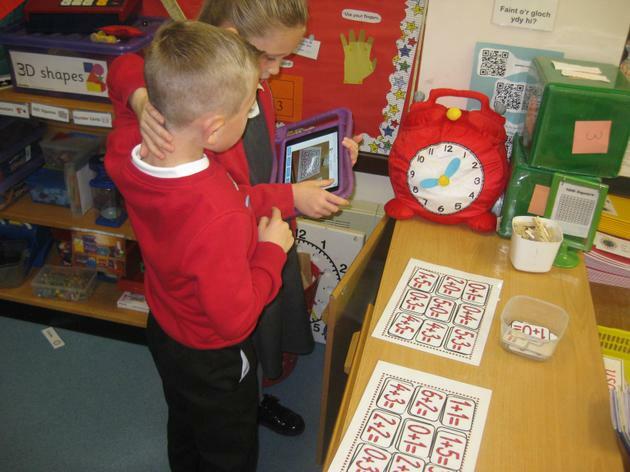 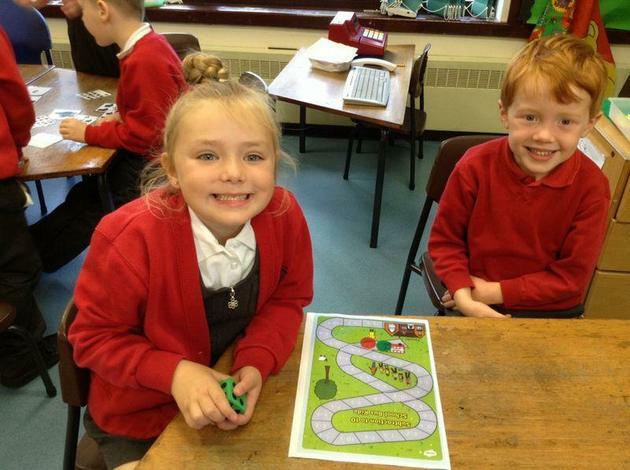 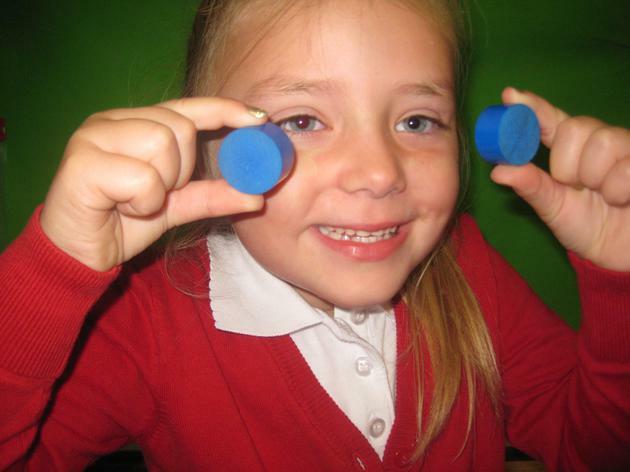 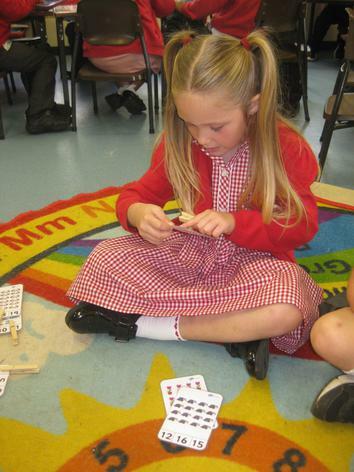 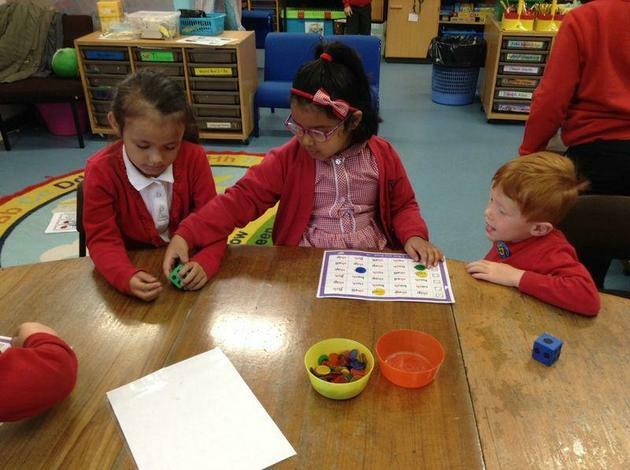 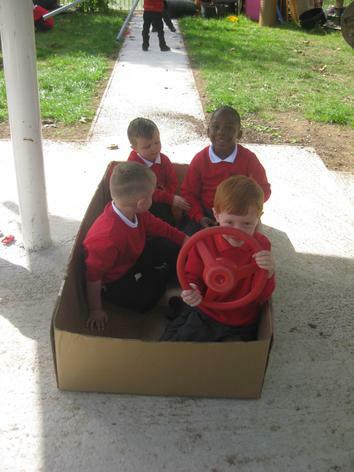 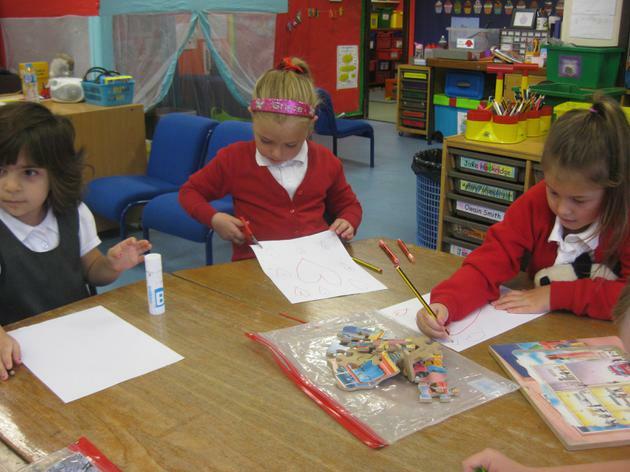 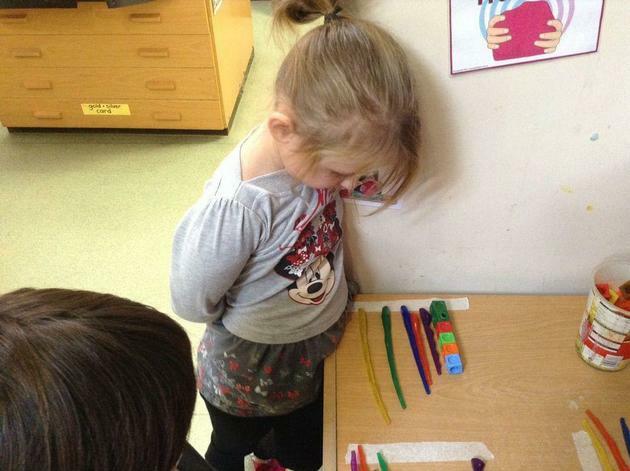 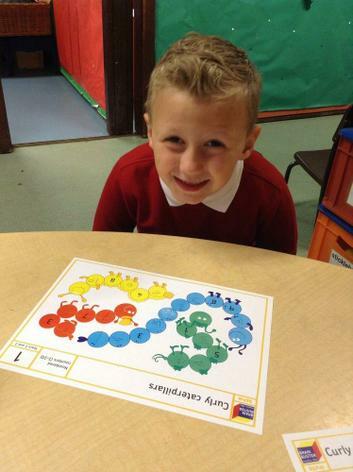 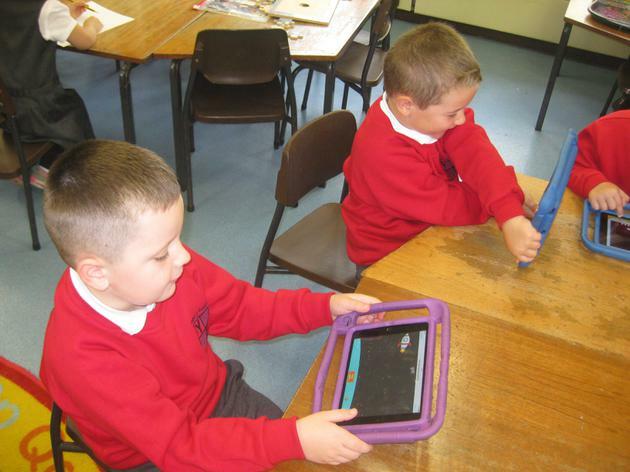 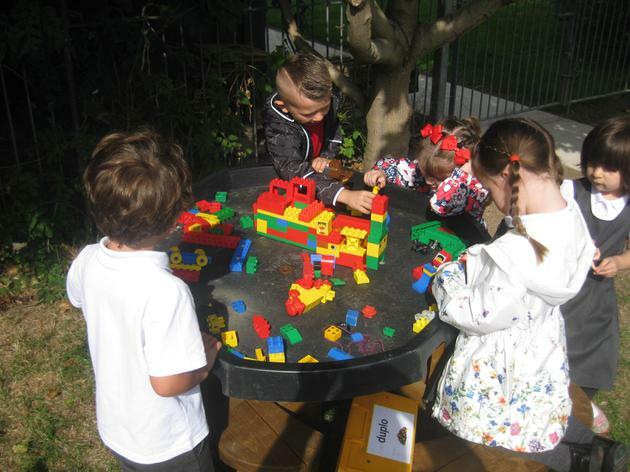 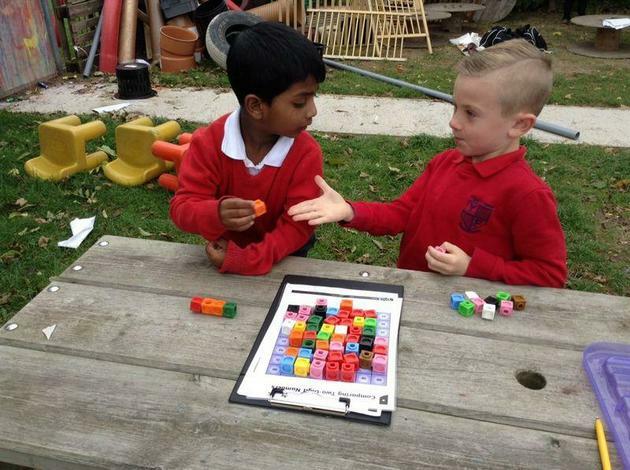 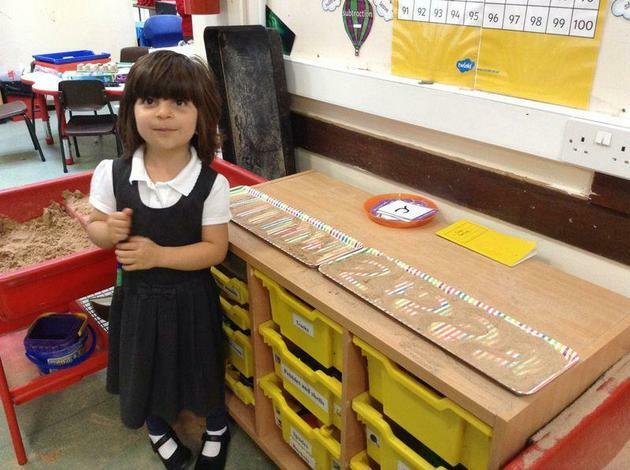 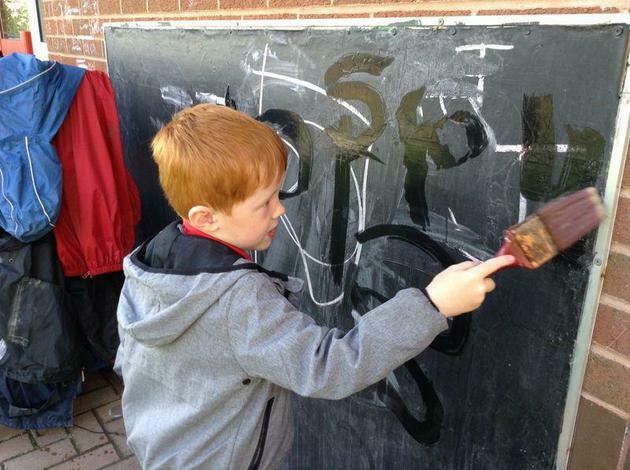 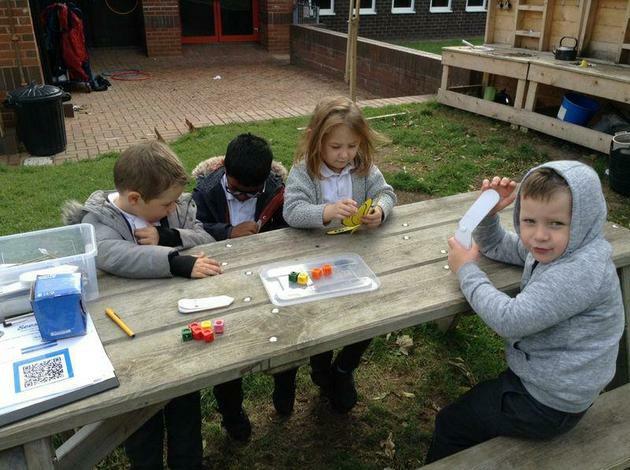 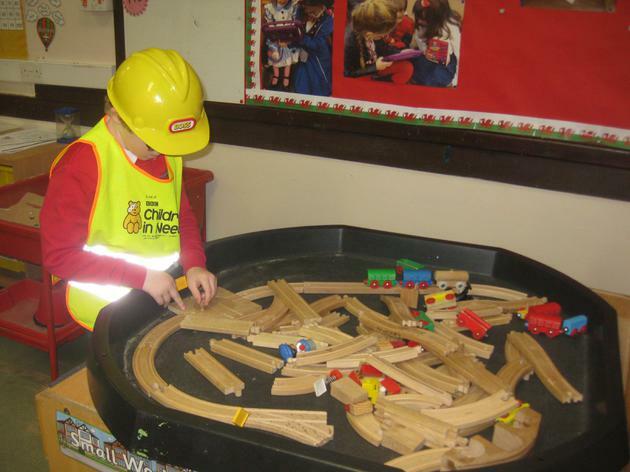 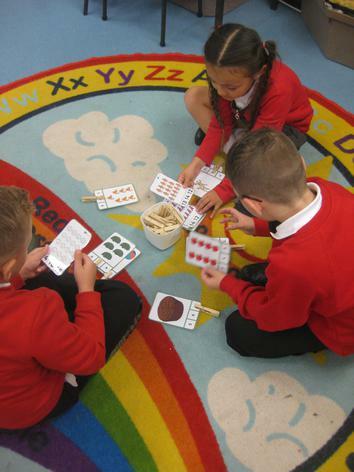 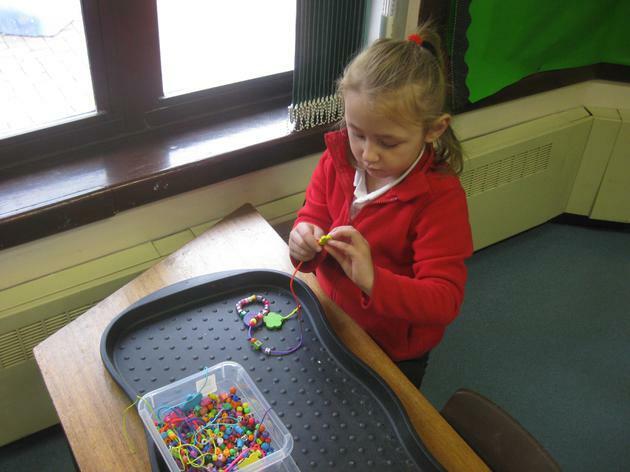 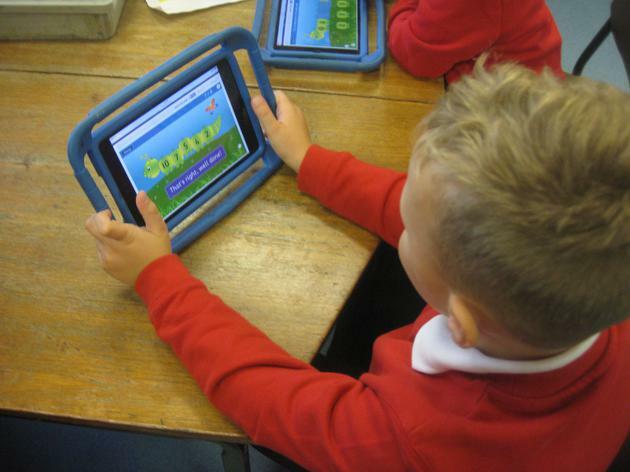 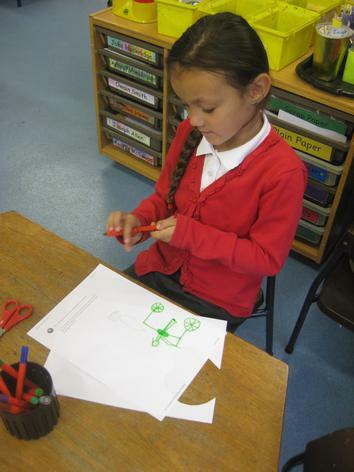 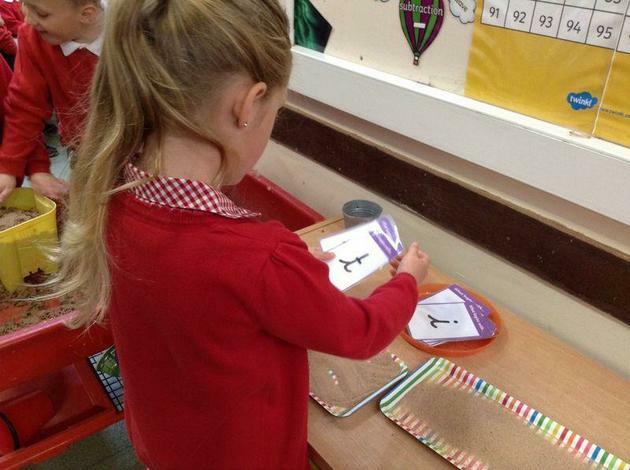 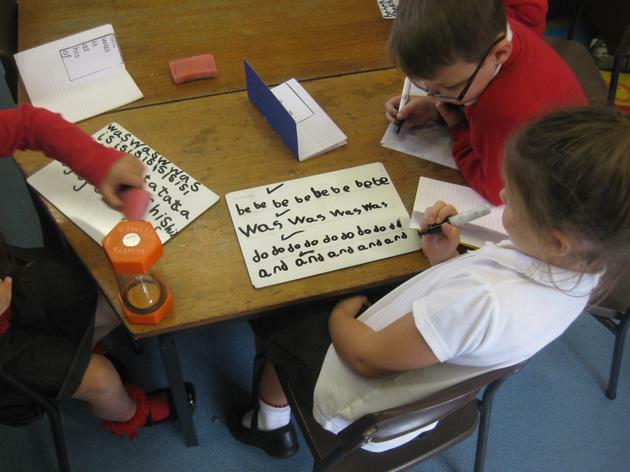 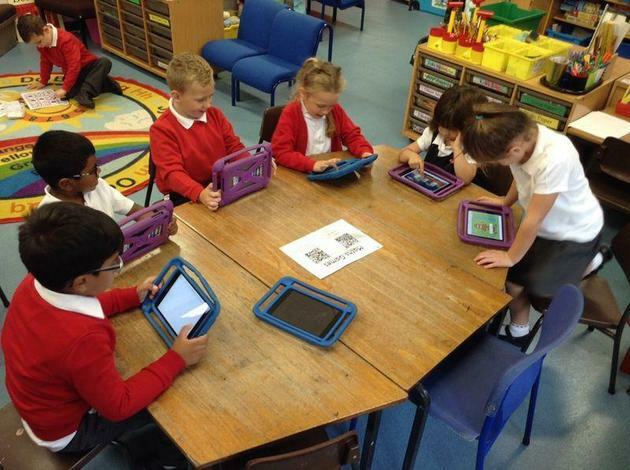 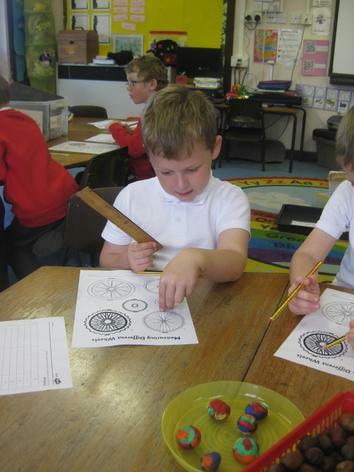 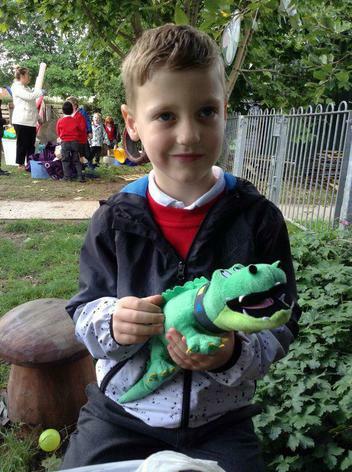 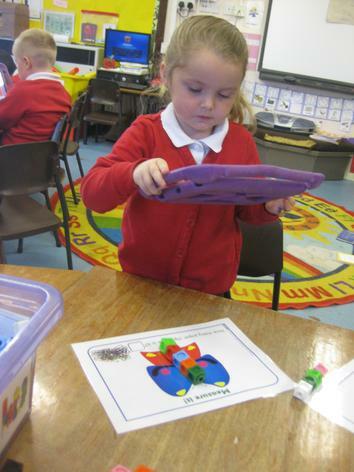 Some of the children have been using objects to solve subtraction problems up to 5 and 10. 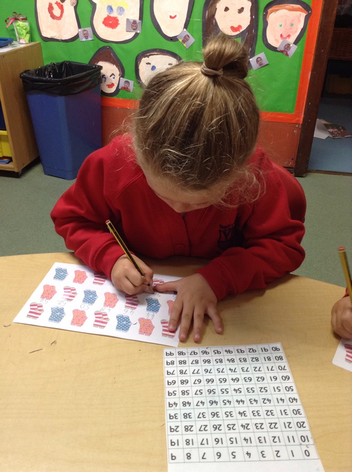 Some have moved on to subtraction problems using numbers up to 20 and 100 by putting the large number in their head, the small number on their fingers and counting back to find the answer (subtracting a one digit number from a two digit number). 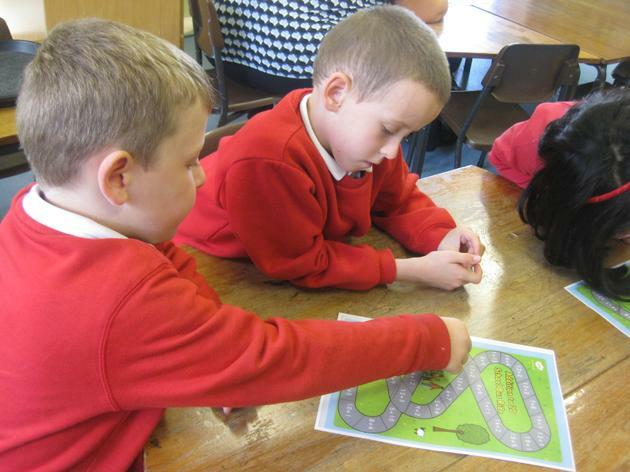 On Tuesday we had a visit from the NSPCC team to talk to us about using our voices to stay safe. 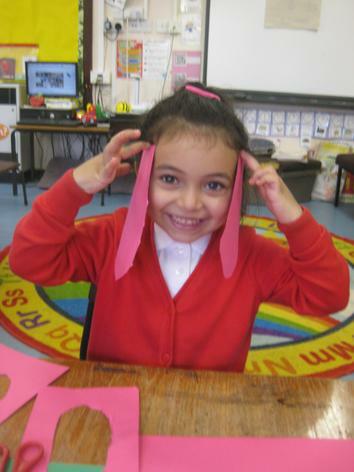 The ladies that visited us were very clear in their explanations and the children were great listeners! 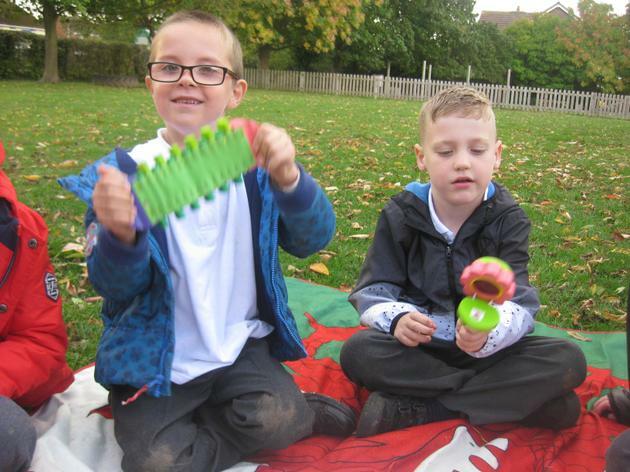 In Welsh we practised our Jambori songs and also revisited the questions 'Pwy wyt ti?' 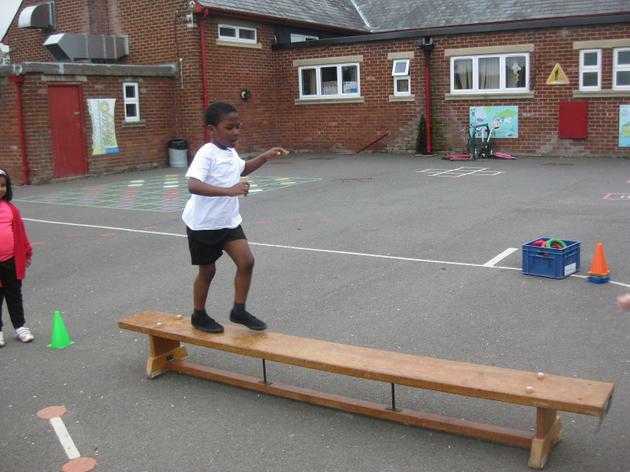 and 'Sut wyt ti?' 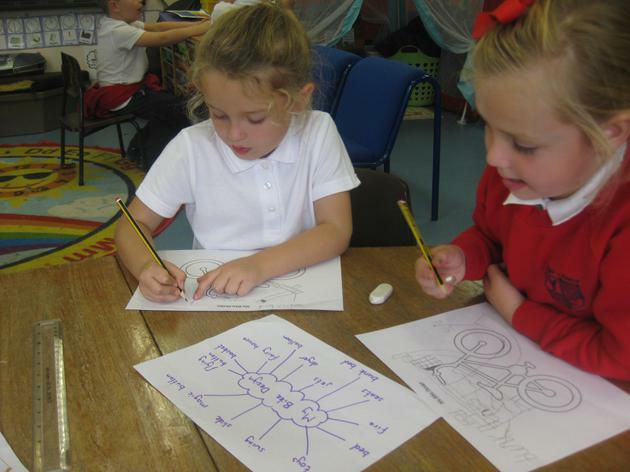 The Helpwr Heddiw will be using these questions next week as part of their morning jobs. 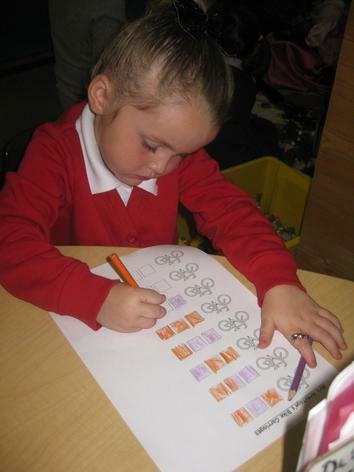 This week we have been getting stuck into our topic based on ‘Mrs Armitage on Wheels’. 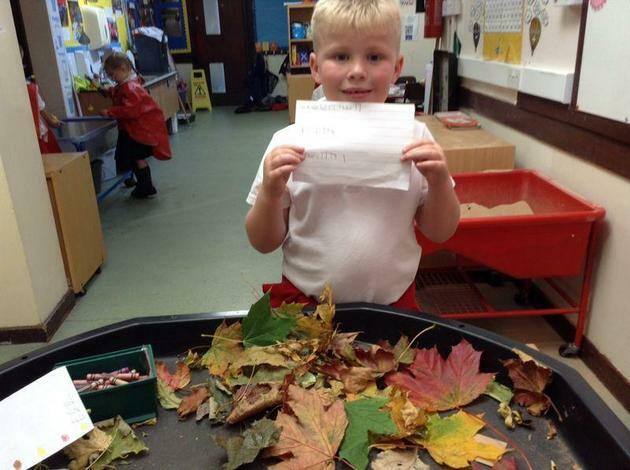 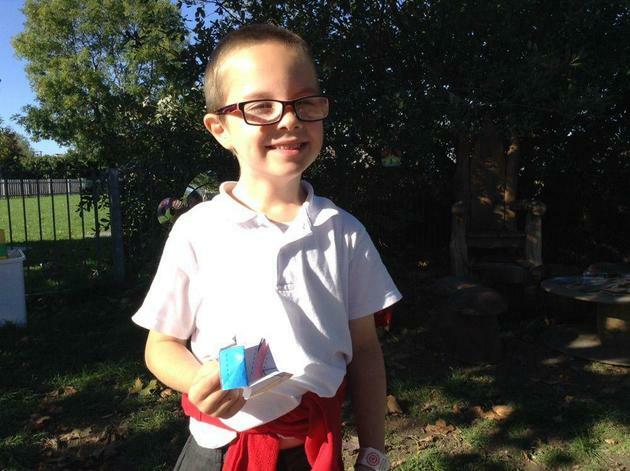 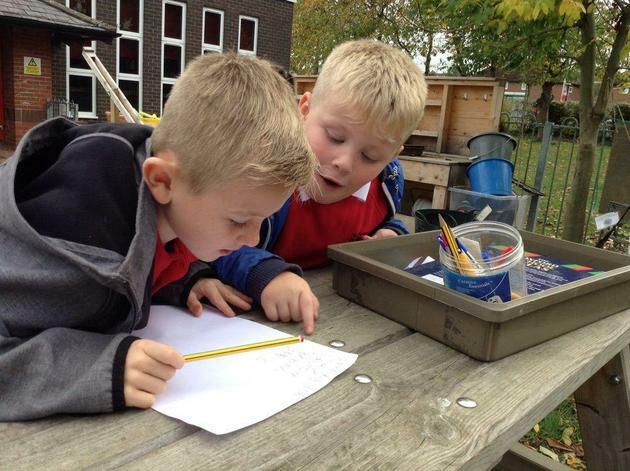 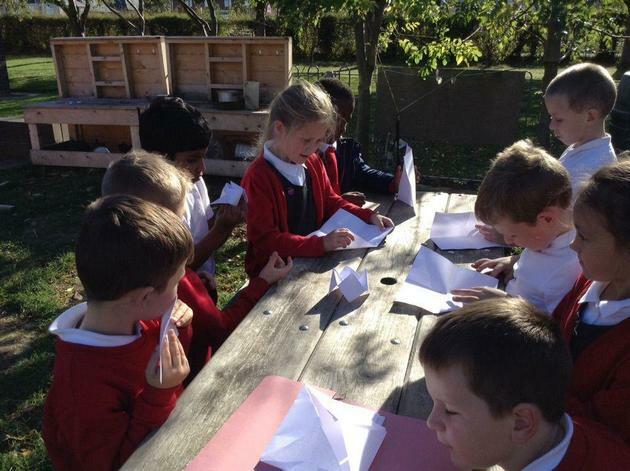 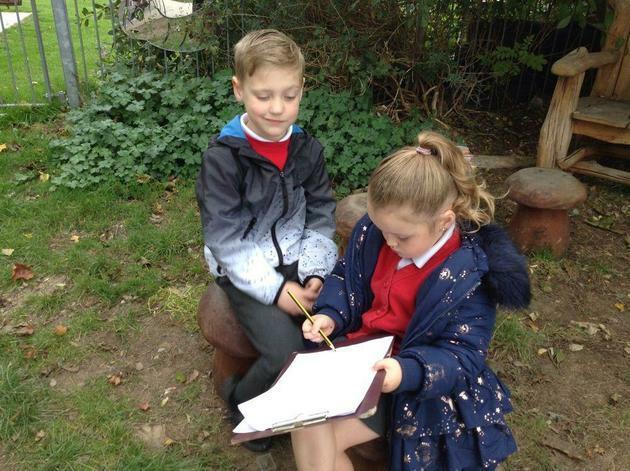 We have been writing letters to Mrs Armitage to let her know that we found all the items that flew off her bike. 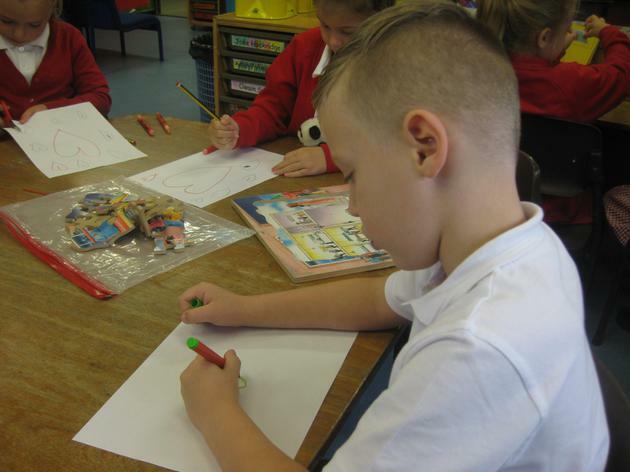 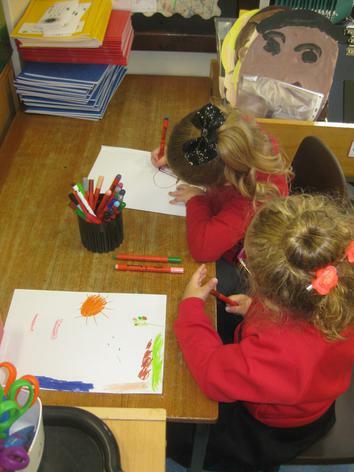 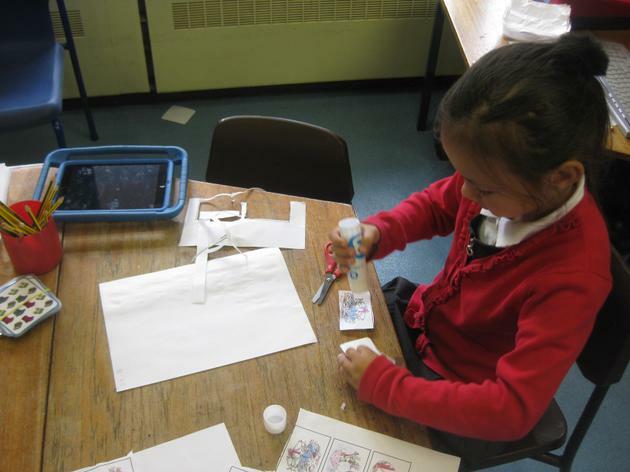 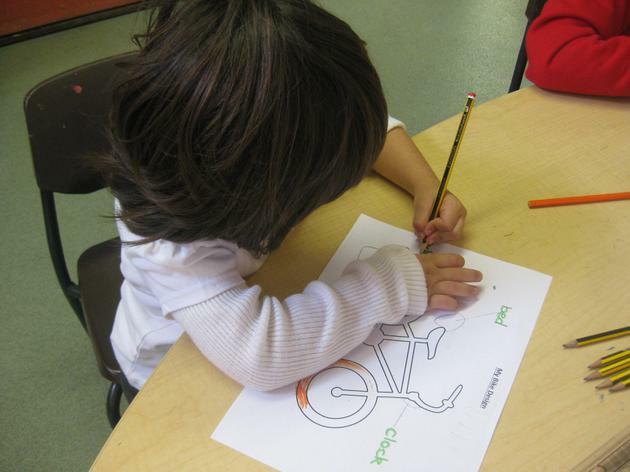 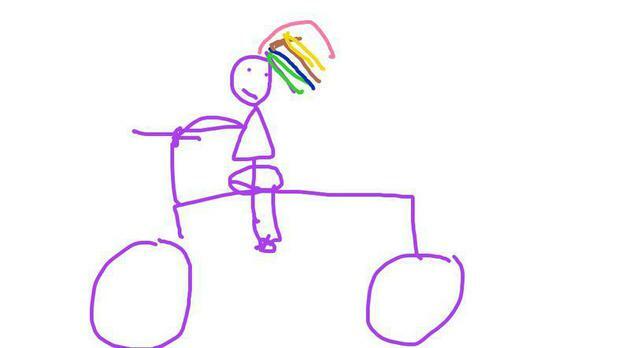 We have been making pictures of Mrs Armitage on her bike, using pencils, crayons, paint and the iPads. 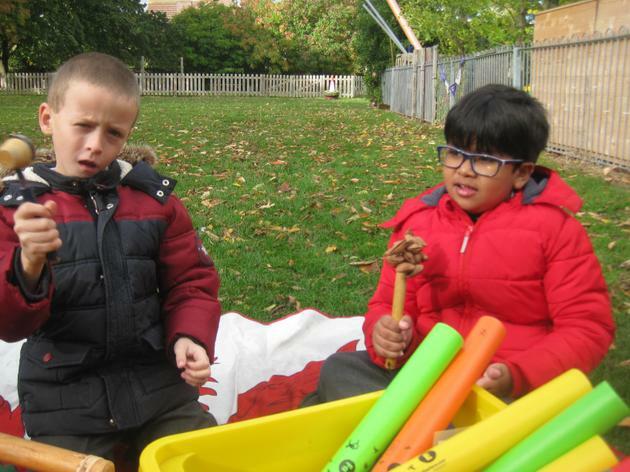 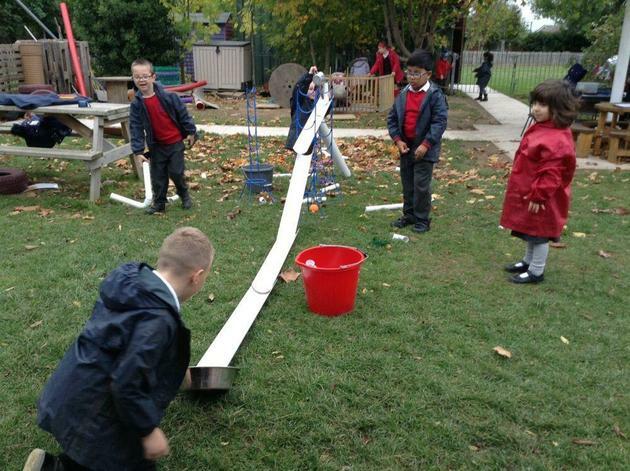 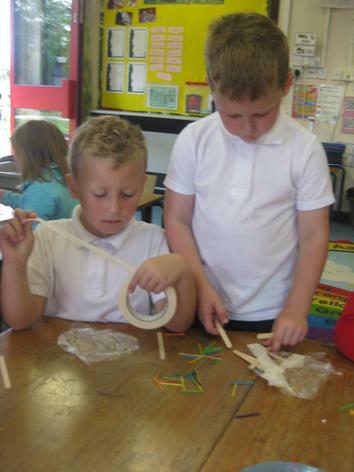 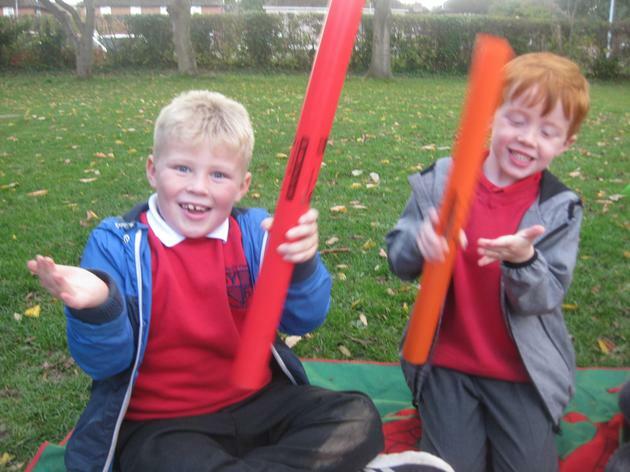 We also started thinking about waterproof materials so that we can make a new umbrella to replace the one that Mrs Armitage broke! 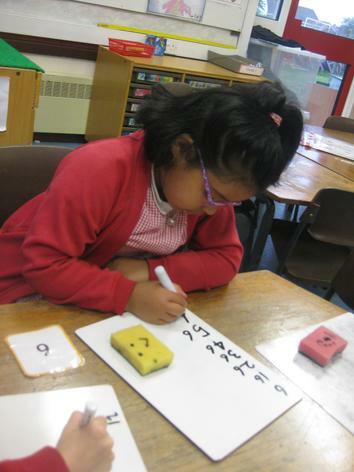 In maths, our focus has been addition. 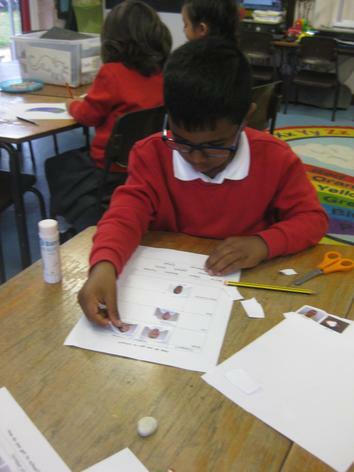 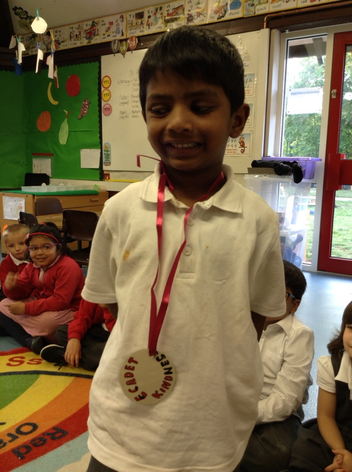 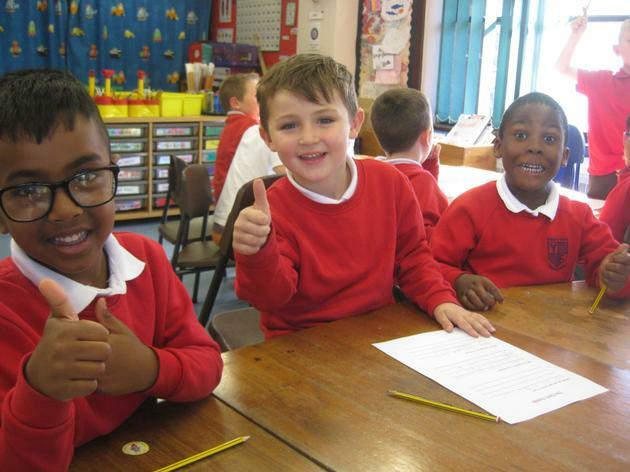 The children have worked really hard at their own levels. 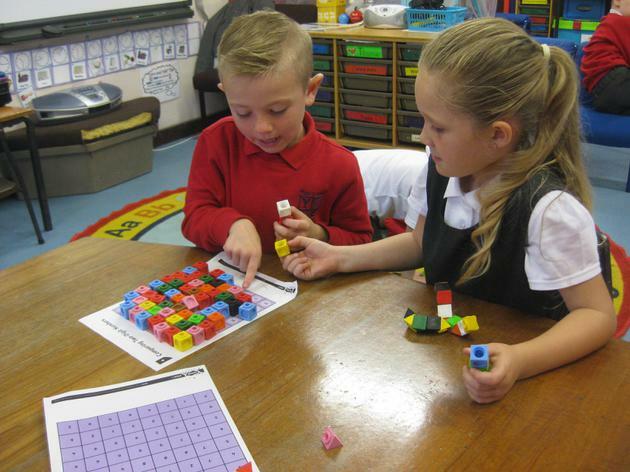 Some children have been solving addition problems up to 10 and 20 using cubes, and some have moved on to mental addition problems using numbers up to 20 and 100 (adding a single digit number to a two digit number). 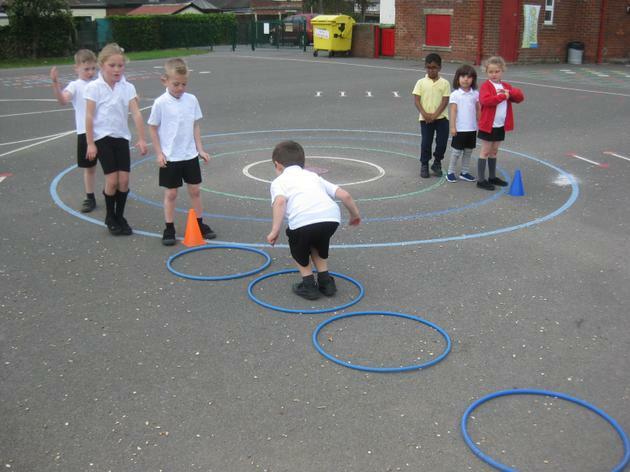 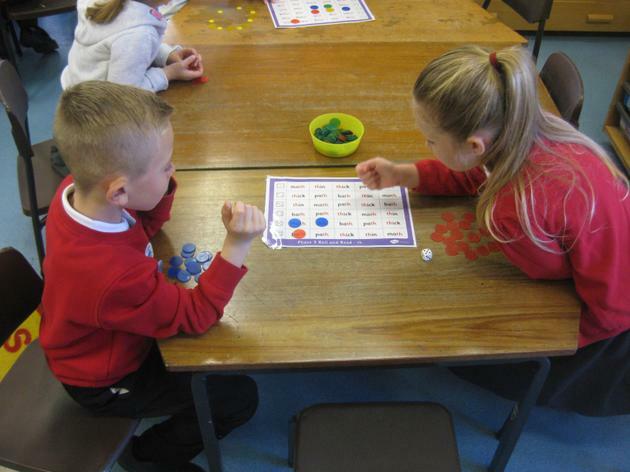 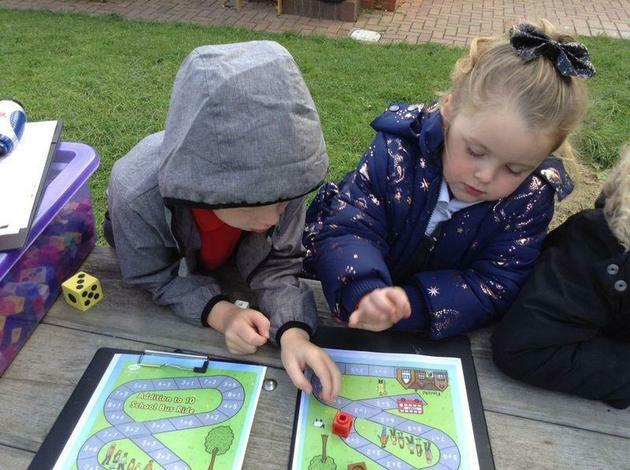 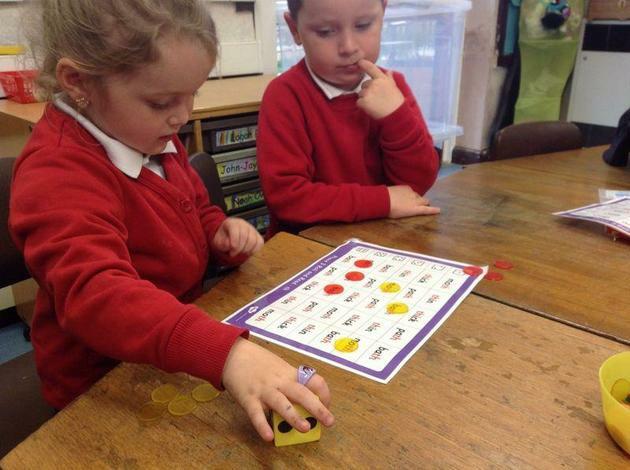 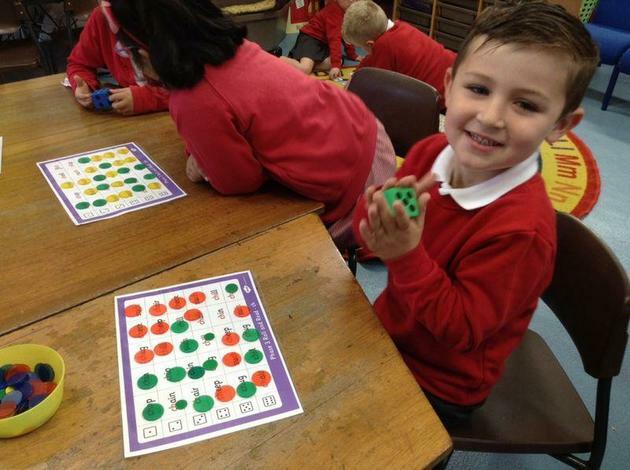 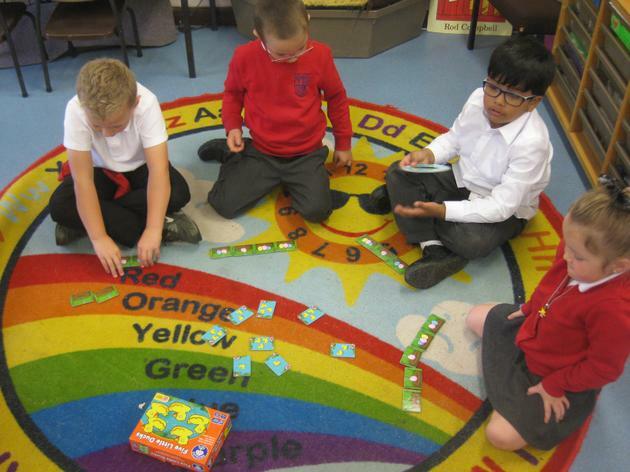 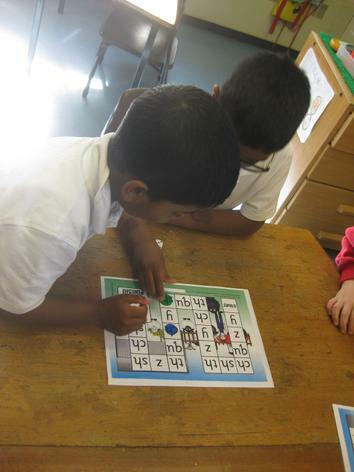 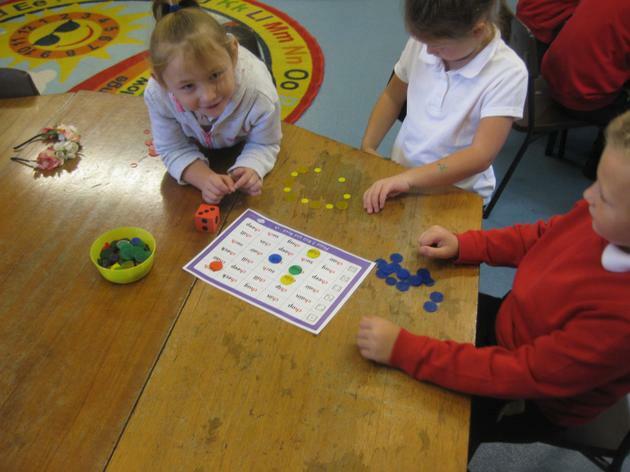 We played a variety of games over the week to practise addition skills. 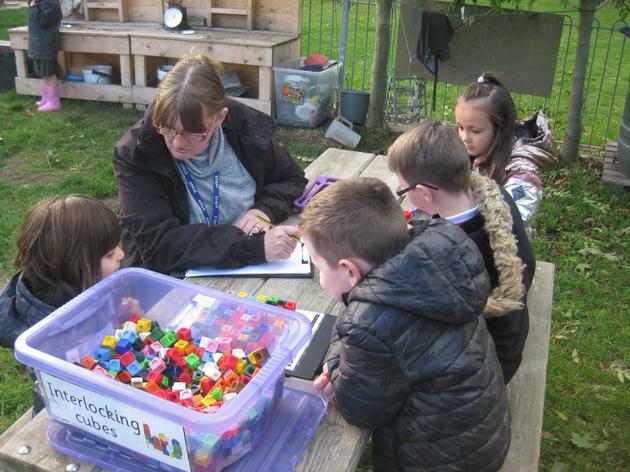 Mrs Stanton also gave us an introduction to Boo Zoo. 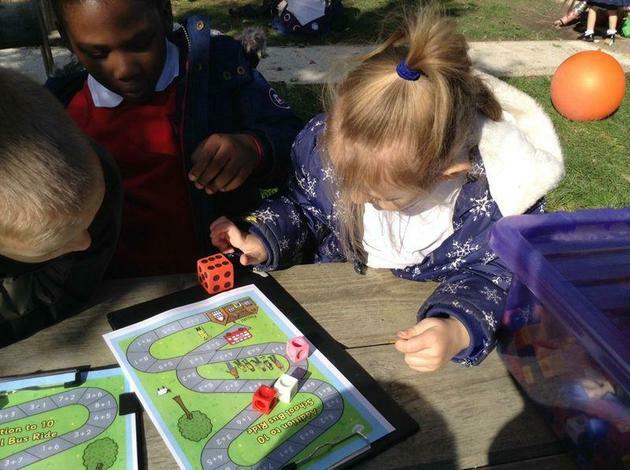 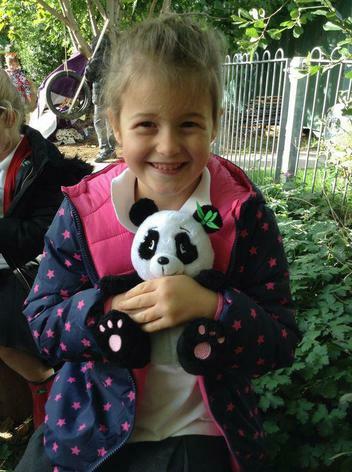 Boo Zoo is a series of story books set at a zoo that teach a variety of mathematical concepts. 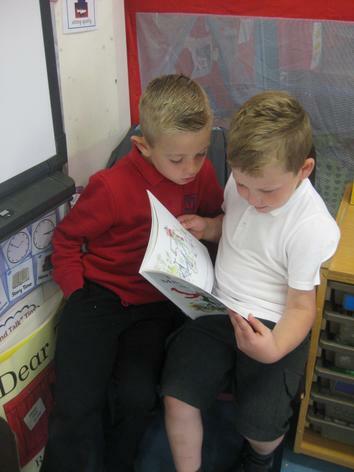 We will be using the stories throughout the year. 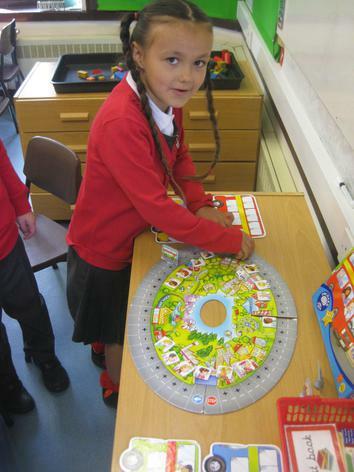 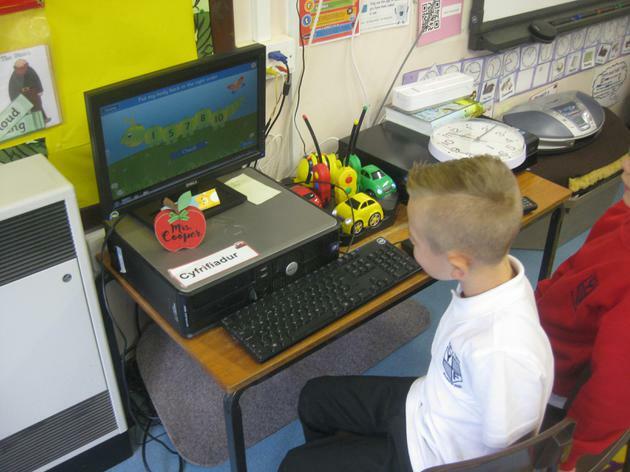 We have also had new spelling books this week so that we can practise our spelling words during our choosing time. 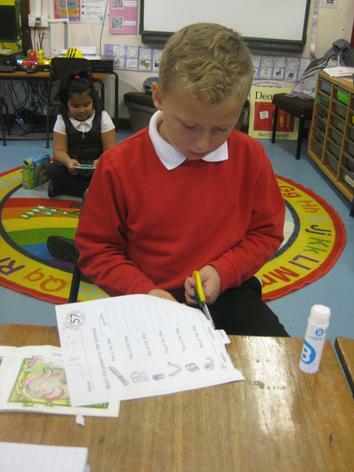 Next week the children will be coming home with a list of words to practise reading and spelling.